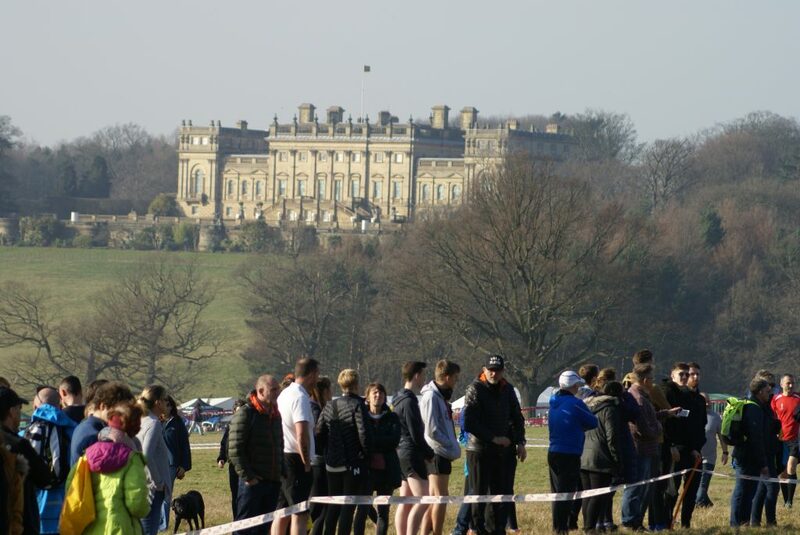 An absolutely glorious day greeted athletes, Coaches and supporters at Harweood House in Leeds at the weekend.The sun shone all day which witnessed some great racing with big fields of athletes in all the age groups. 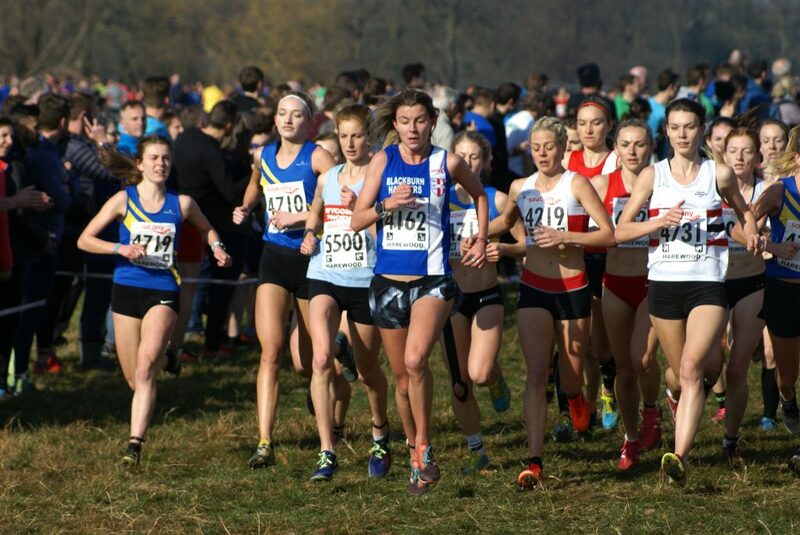 Highlight of the day for the Harriers was Jess Judd’s run in the Senior Women’s Race which saw her win the Bronze Medal for her 3rd placed run (28.52) behind Phillipa Woolven in 2nd (28.28) and the winner, Emily Hosker Thornhill (28.17). 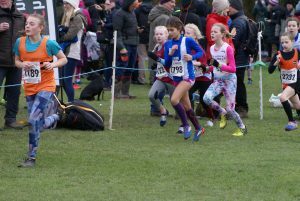 Jess took the race on from the front and led up the first climb from the start to the top of park and again coming round on the second lap. 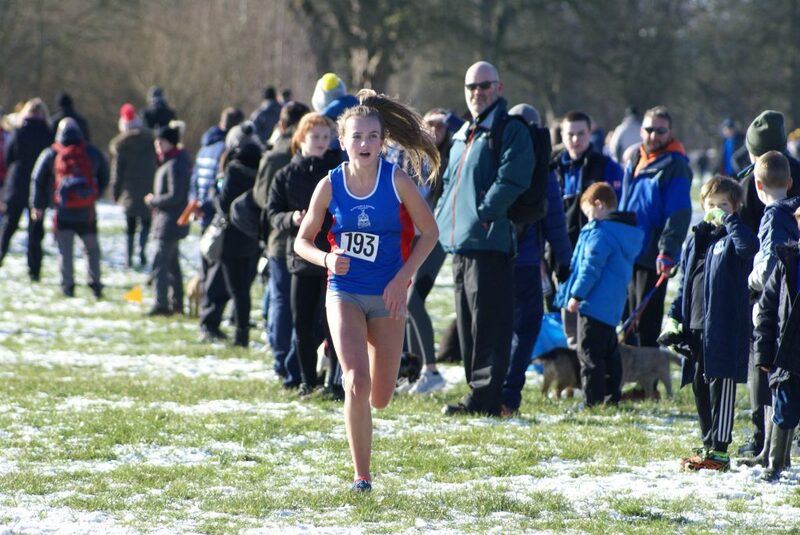 Great effort to set the pace and a well deserved podium place and Bronze Medal was her reward. 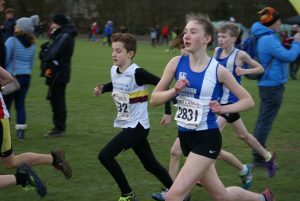 Annabel Ralph in her first ever National Cross Country Championship race also had a very good run as she came home in a top 100 place, clocking a time of 32.45 in 85th position and an indication of her continued improvement over this cross country season. 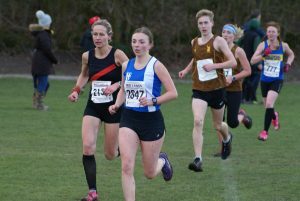 Next home for the Club came Ellen Sagar-Hesketh (358th) with a time of 37.56 followed by Lindsay Davies (505th) in 40.31 out of a field of 1034 athletes who finished the race. 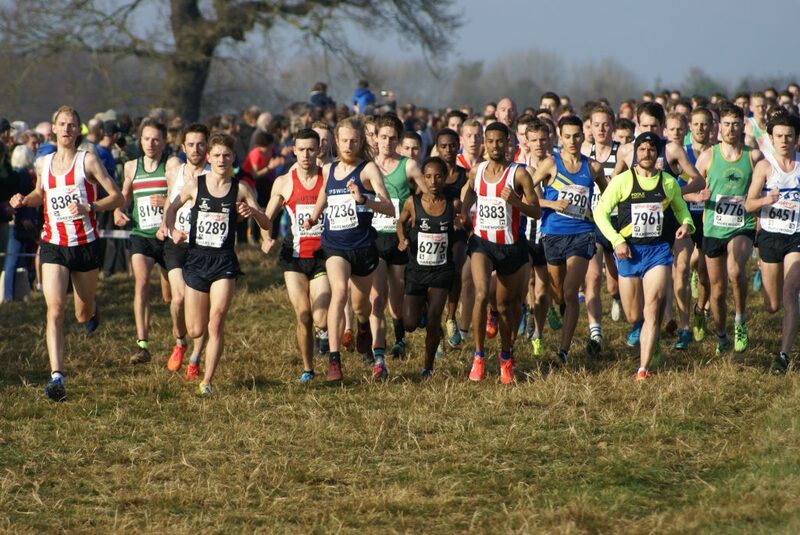 The Senior Men’s team had a very good day with the first two counters home in the top 100 and finishing 15th Club in both the 6 Man Team featuring 135 complete teams and 9 Man Team which featured 74 complete teams. 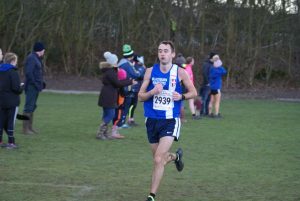 Rob Warner was following up his new PB of 14.41 for 5k at Armagah recently and continued in that form, clocking 39.18 to place 68th out of a field of over two thousand finishers. 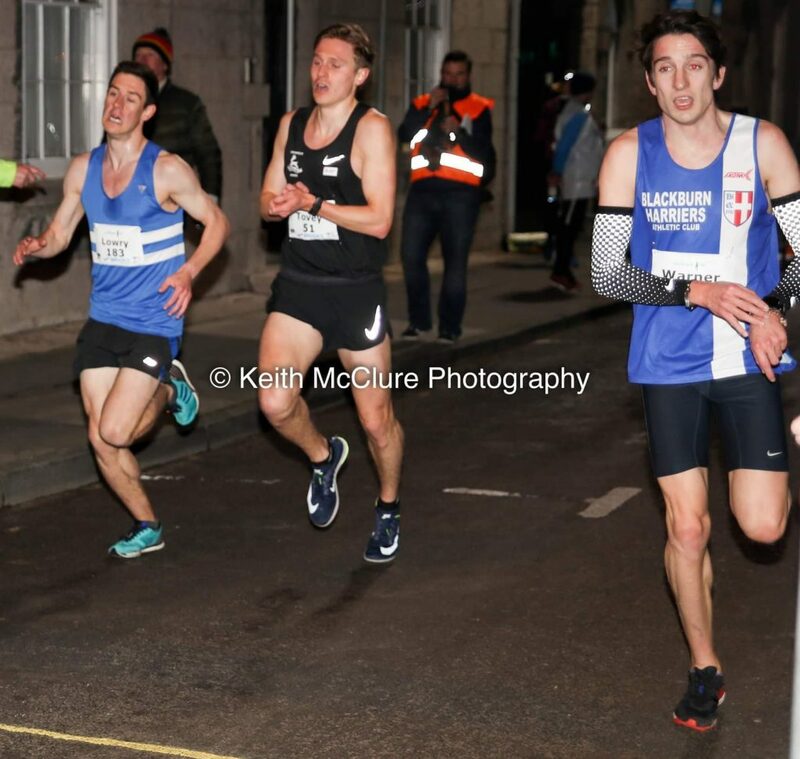 Also in good form was Tim Raynes who recenlty ran 68 minutes in the Barcelona Marathon and he displayed that form too at the champs with a final placing of 95th in a time of 39.52. 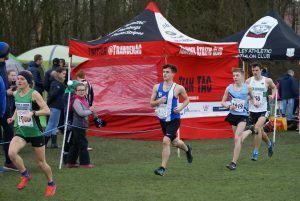 Jack Hindle made it into the top 200 with a clocking of 41.28 with just four seconds seperating 14 athletes in and around him. 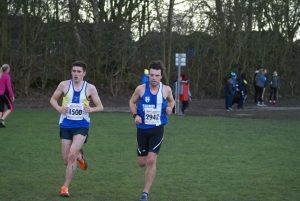 Just 13 seconds further back with a very good run came Marc Hartley in 215th running 41.41 with Josh Holgate who crossed the line in a time of 42.00 (240th). 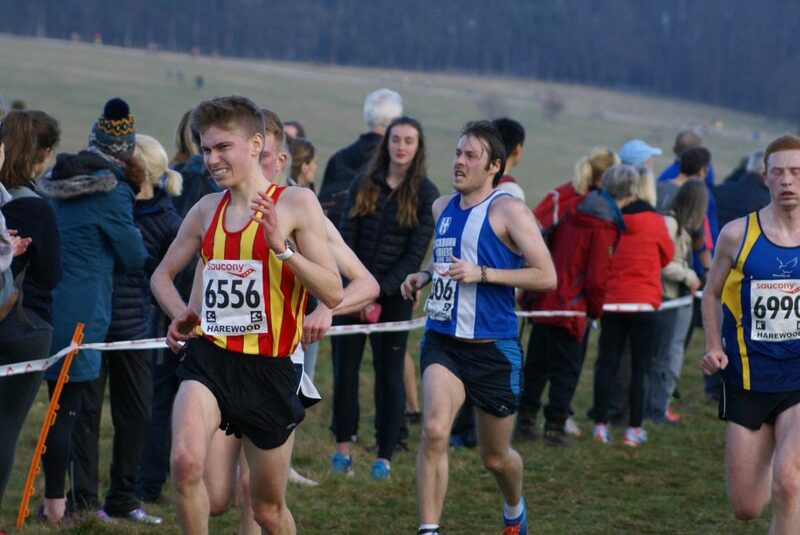 Chris Davies, another athlete having a very good year alongside all of our senior men, ran a time of 42.26 in 274th place with Karl Billington (43.02) in 333rd, Tom Blaney (43.10) in 347th, Calum Holmes (645th) in 46.20, Paul Guinan running a time of 47.56 in 821st, Gary Pearse in a time of 51.55 (1236th) and Allan Hartley in 1874th place (63.09). 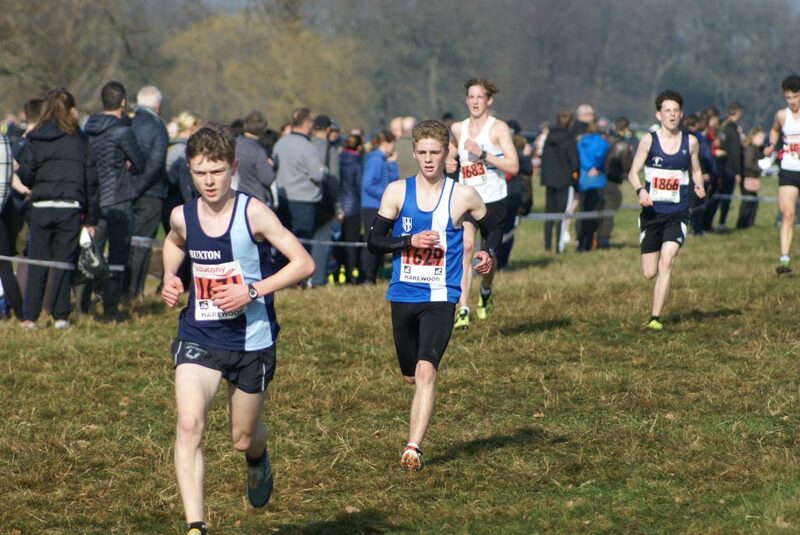 Two hundred and seventy two athletes contested the U17 men’s Race which produced another highlight for the Club in the run by botom of age Matt Ramsden, finishing 16th overall in a time of 19.38 with Sam Hodkinson, also bottom of age clocking a time of 21.28 in 95th place. 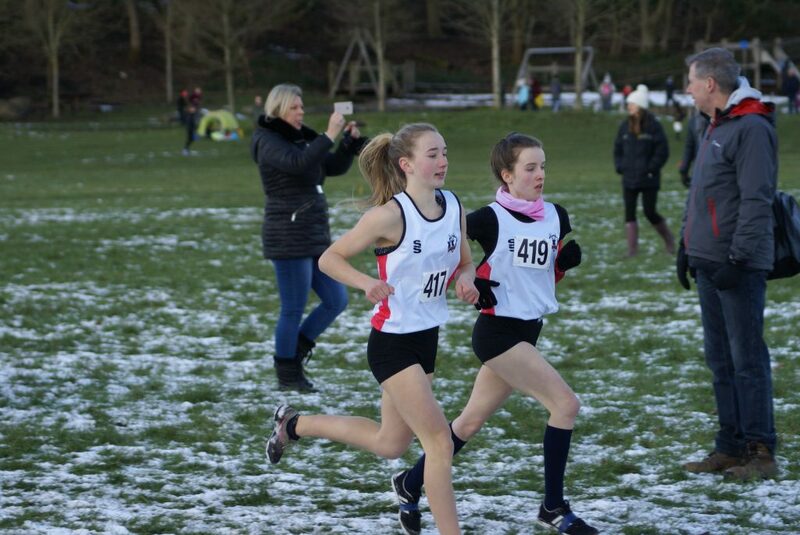 Amy Davies ran in the first race of the day – U17 Women’s won by Olivia Mason – and clocked 20.48 in 87th spot. 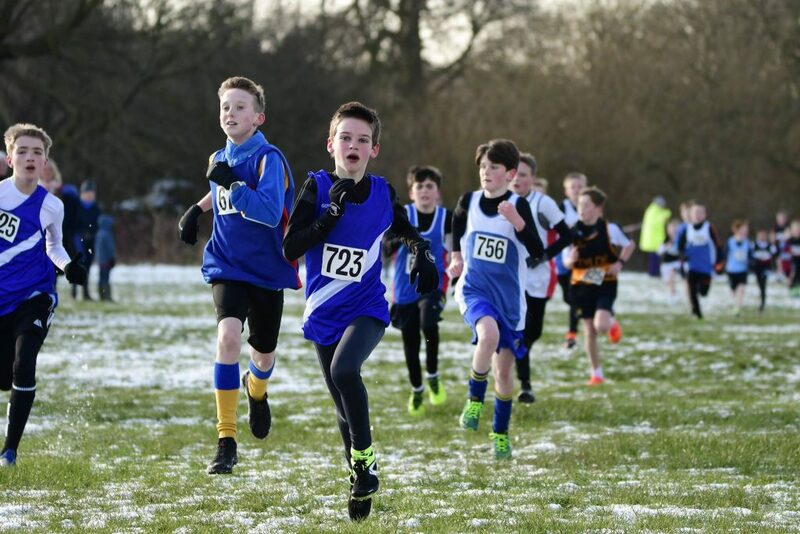 In the U13 Boys Race the team finished 24th out of 43 complete Teams with Isaac Butler the first across the line in the 400 plus strong field in a time of 11.32 (116th). 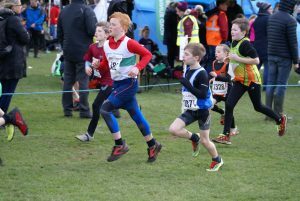 Theo Watson and Dexta Thompson were credited with the same time of 11.35 with Theo placed 125th and Dexta 126th. 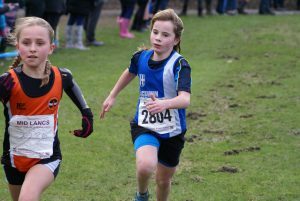 Then came Codie Dewhurst (12.28) in 275th and Oliver Gill in 312th clocking 12.54. 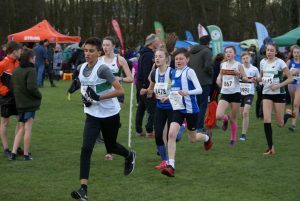 David Holman and Sebastian Burton ran in the U15 Boys race with Amelia Burton and Isabelle Hartley running the U13 Girls. 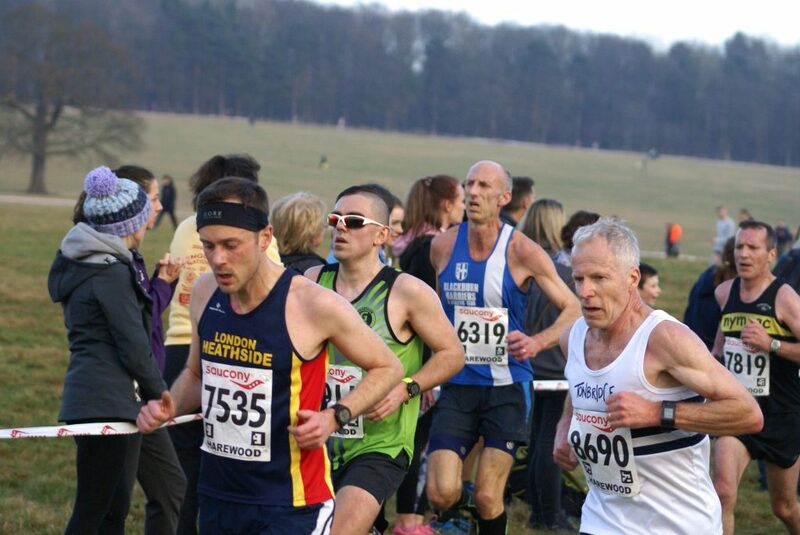 David came home in 194th place with a time of 15.50 out of just short of 350 runners who finished the race. 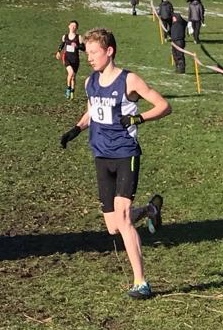 Sebastion placed 329th (19.01). 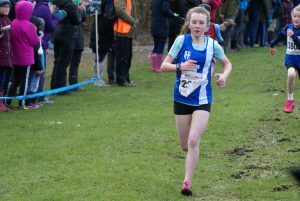 Isabelle Hartley clocked a time of 15.20 (405th) whilst Amelia Burton came home in 262nd spot with a time of 13.24. 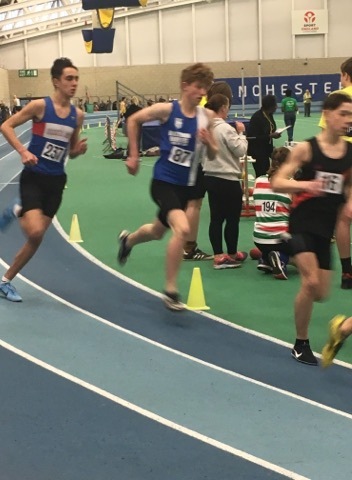 It was a pretty good weekend for U15 Ben Boocock at the Indoor National Championships as he posted a new PB of 9.22 in the Heats of the 60m Hurdles before going on to come home in 4th place in the Final in a time of 9.25. 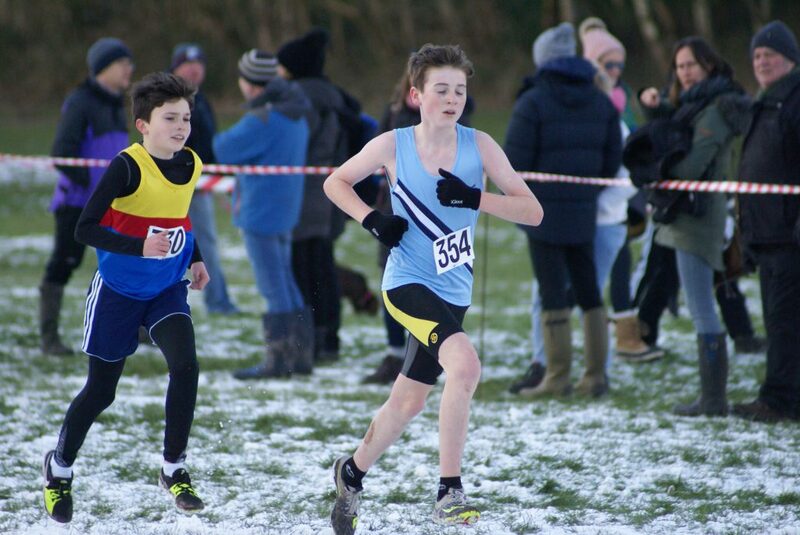 Ben started the year with a personal best of 9.56 and has already knocked over three tenths off this time. 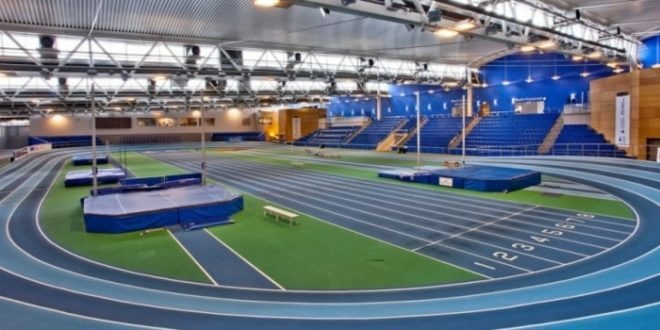 U17 Myah Booth ran a time of 9.47 in her Heat of the 60m Hurdles. 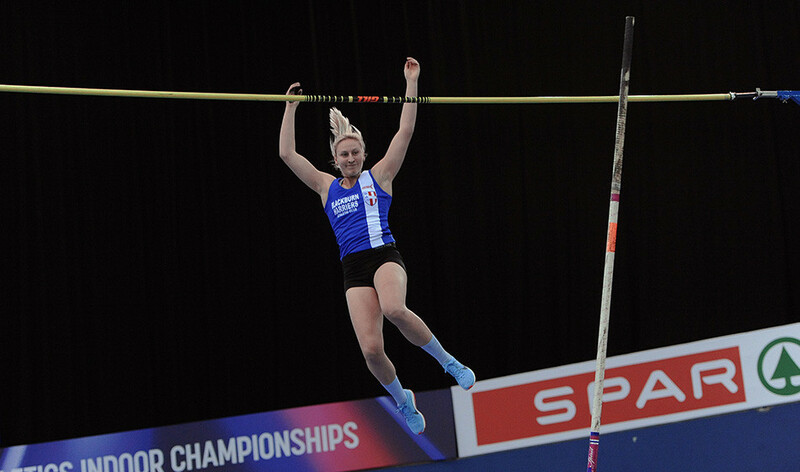 Holly Bradshaw has had a fabulous two weeks starting with winning her 11th British Title with a winning Vault of 4.80m two weeks ago and then following that up with a first time clearance of 4.81m to win the International Muller Grand Prix Indoor Meeting in Birmingham this weekend. 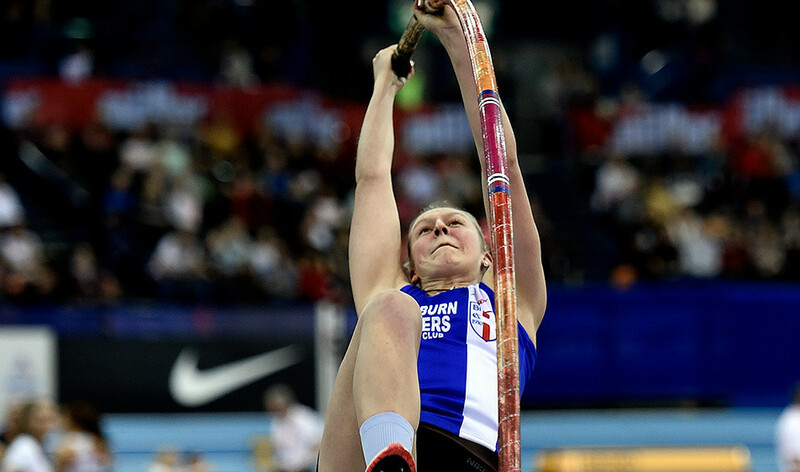 In doing so, Holly was in front of Olympic Champion Katerina Stefanidi as well as world ranking pole vaulters – Katie Nageotte and Nikoleta Kiriakopoulou and puts Holly to number 3 in the World Rankings. 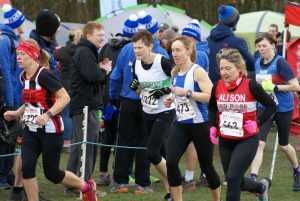 A big field saw six hundred and thirty three finishers in this 20 mile race won by Matthew Richards in a time of !hr 52.59. 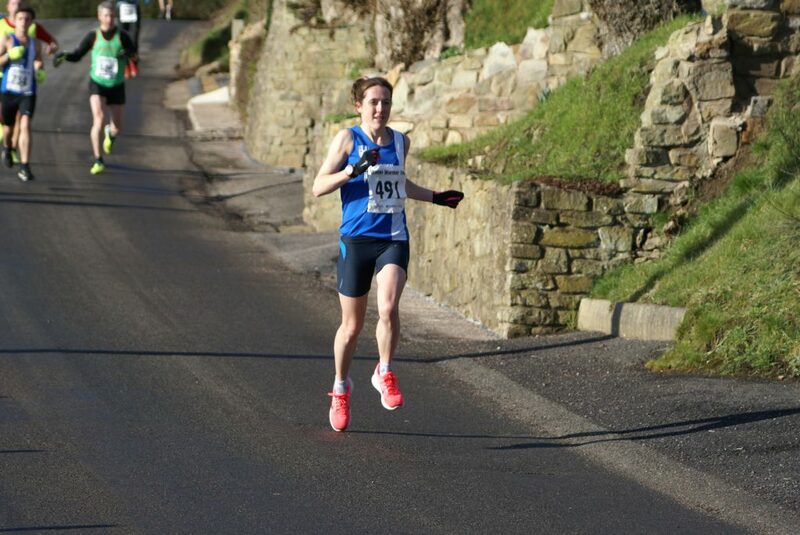 Blackburn Harriers Rachel Wood had a very good run in preparation for running the Boston Marathon as she placed 2nd in the Women’s Race clocking 2hr 12.50 behind the winner Charlotte Firth (2.06.02). 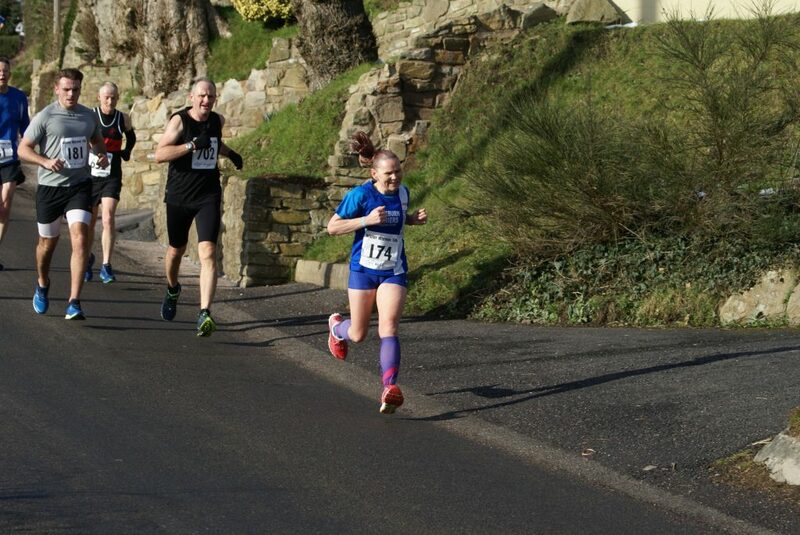 Rachel’s run was a minute faster than her previous best and setting a new PB over this distance was a great effort. 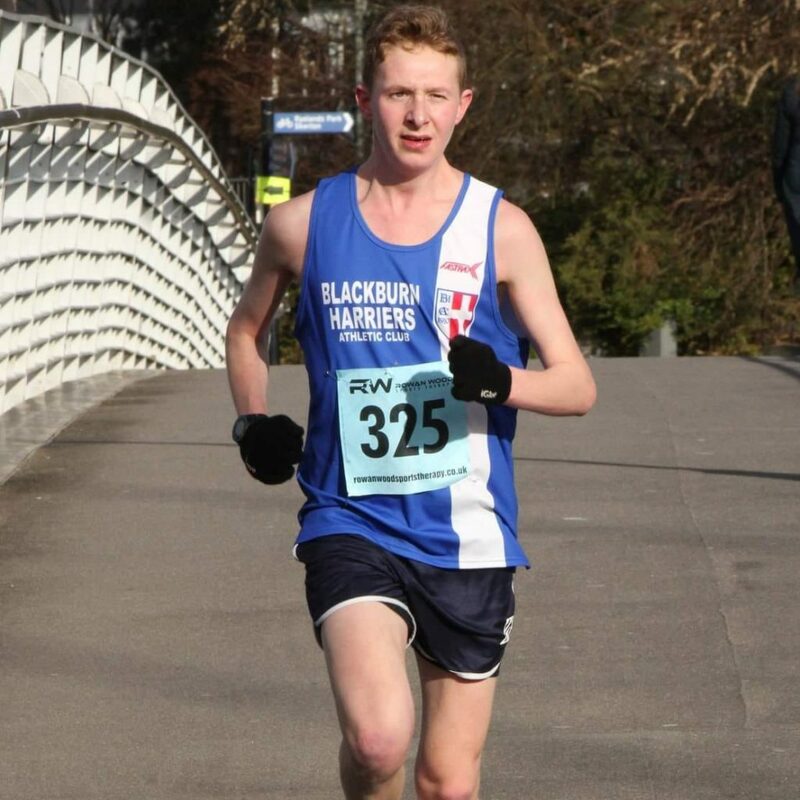 Jonny Kay from Bolton won this race, featuring one hundred and thirty four runners, comfortably, in a time of 15.35. 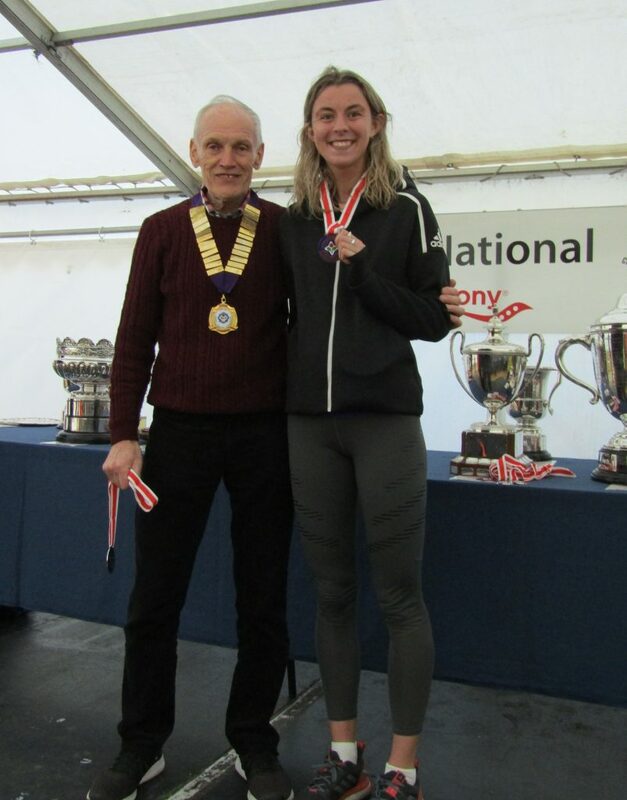 Carmen Byrne (V40) contested the race for the Harriers and finished with a time of 20.07 which was good eneough for her to th take the 1st Women’s Prize and V40 Women’s Prize. 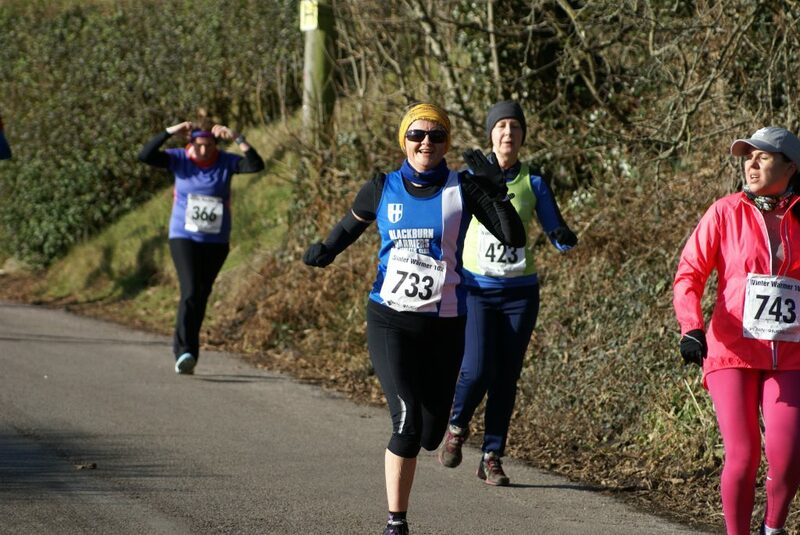 Speaking to the Club, Carmen commented “It wasn’t fast, as I’d had to get up at 5am to manage my food properly, so ran strongly until last k, where usually I can pick up pace a lot more, but today despite a mid race snack i slowed up. 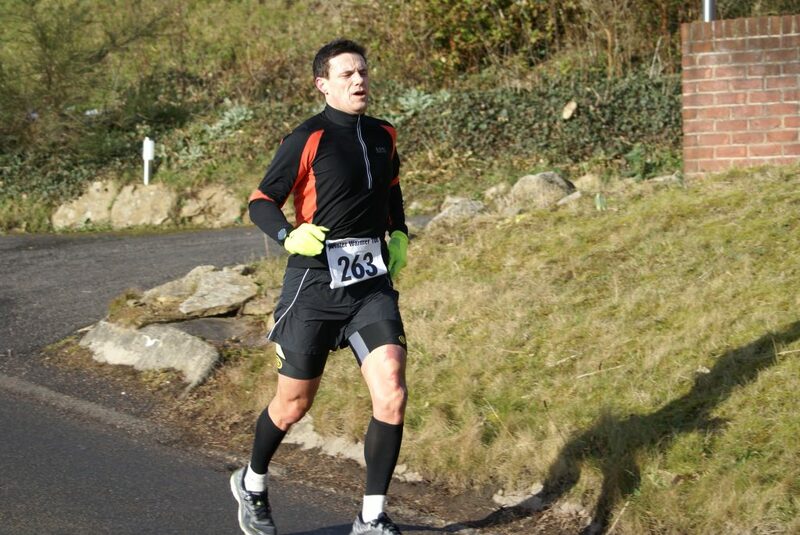 My 20.07 also included a decent climb and few undulations. 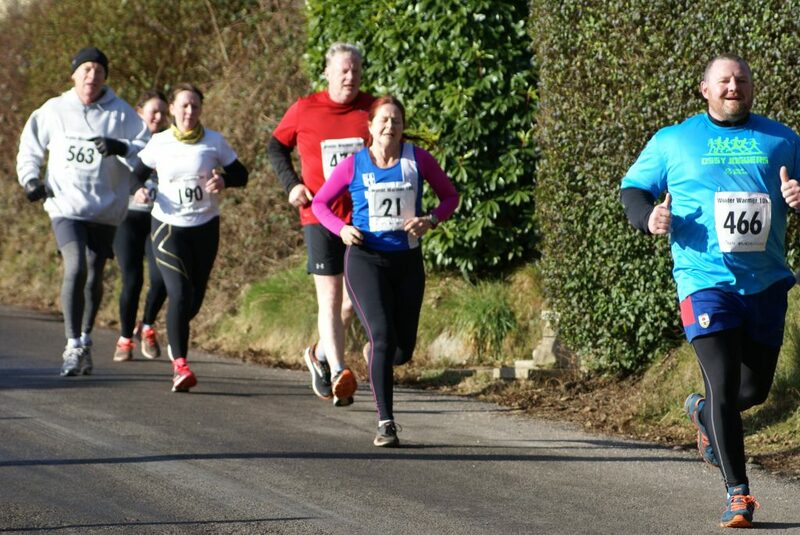 Am going to look for a few more 5ks but flatter and with later starts . It was still pretty enjoyable though”. 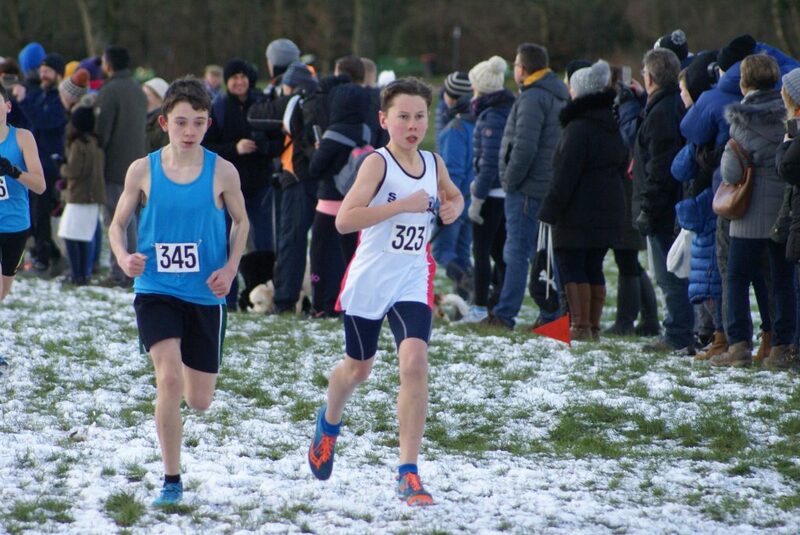 U15 Hayden Mercer ran the 600m at Sportscity in December 2016 and clocked 1.34.44 in the U15 Race. 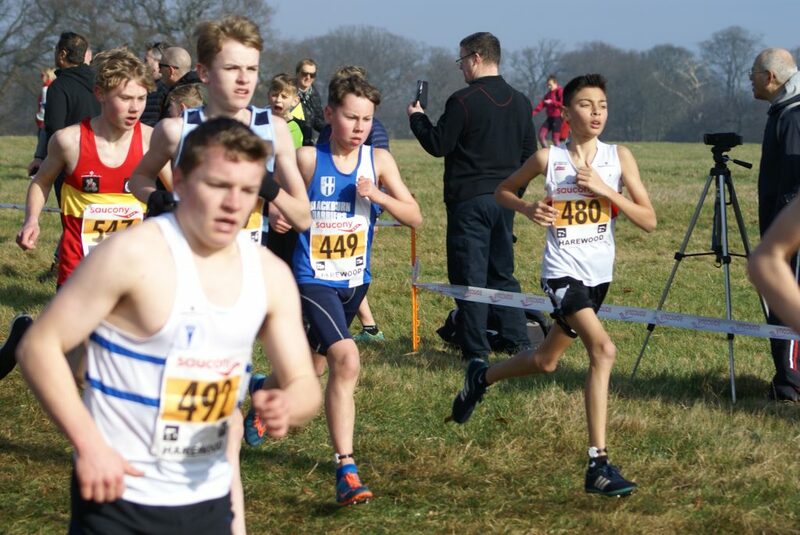 At the weekend he finished up running in the U17 race – crossing the line in 3rd place – which was a learning experience for the young athlete and afterwards he told us “I had a slow first lap and realised that I was lacking in pace. 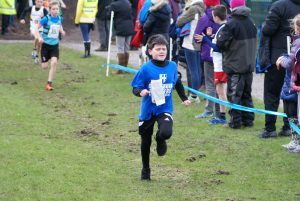 I accelerated on lap 2 and on the final lap to overtake 2 other competitors. 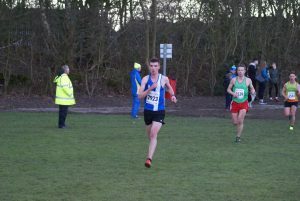 My time was 0.12sec off my PB which I am pleased with after all the winner was an U17 runner! 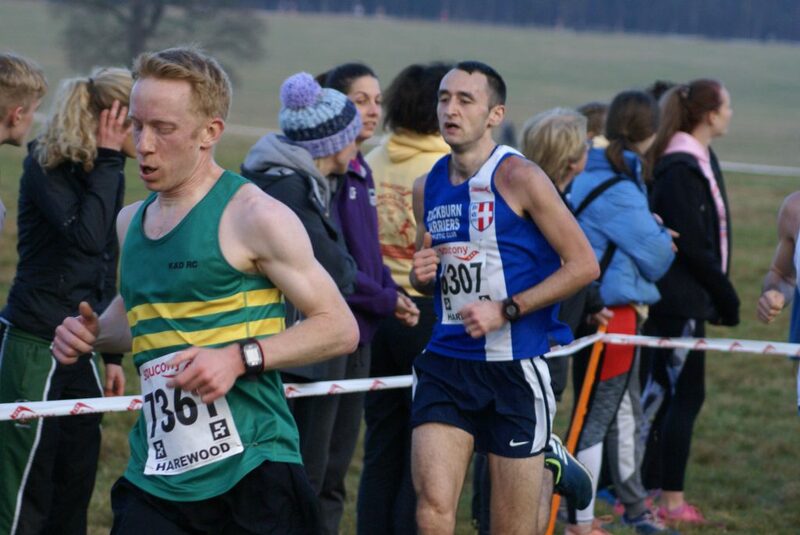 3rd today in a time of 1.34:56″. 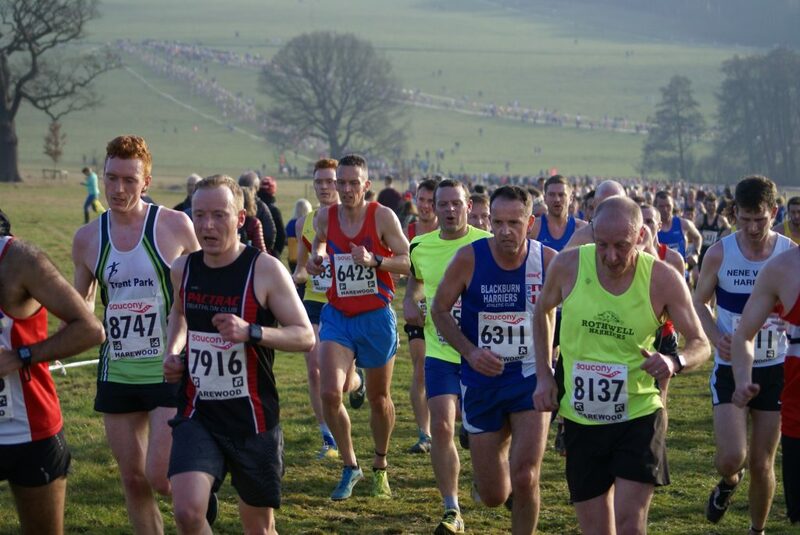 The race starts from Bleasdale Parish Hall, heading north on the road for 200 metres where a cattle grid is crossed before the route leaves the road and crosses farmland for around 1500 metres, likely to be wet and muddy, passing Bleasdale Circle and on to Higher Fairsnape Farm. 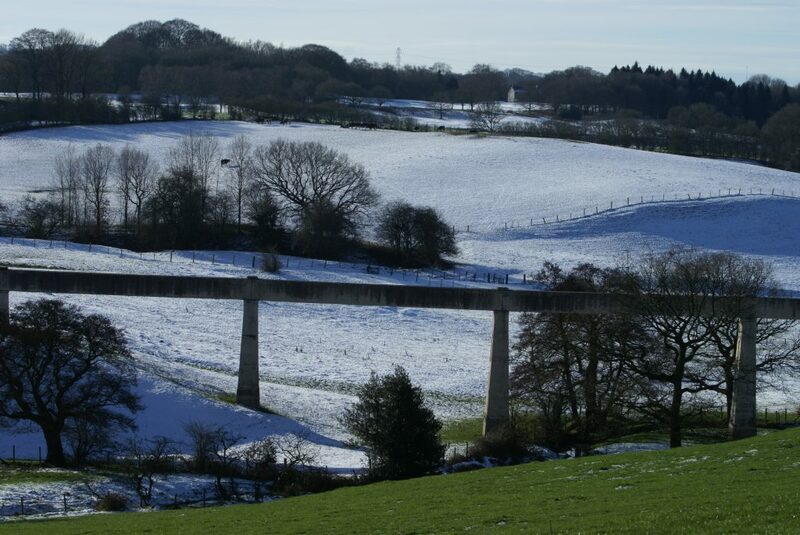 A farm track now climbs gradually for around 1500 metres to the fell gate. The route then climbs steeply, on rough grass and with some rocks that may be concealed, to reach Paddy’s Pole, check point. From Paddy’s Pole the route descends gradually on a fell path, grass/rock, before climbing gradually to Parlick, check point. From Parlick the route descends steeply, mainly on rough grass with some rocks that may be concealed under grass and reeds. 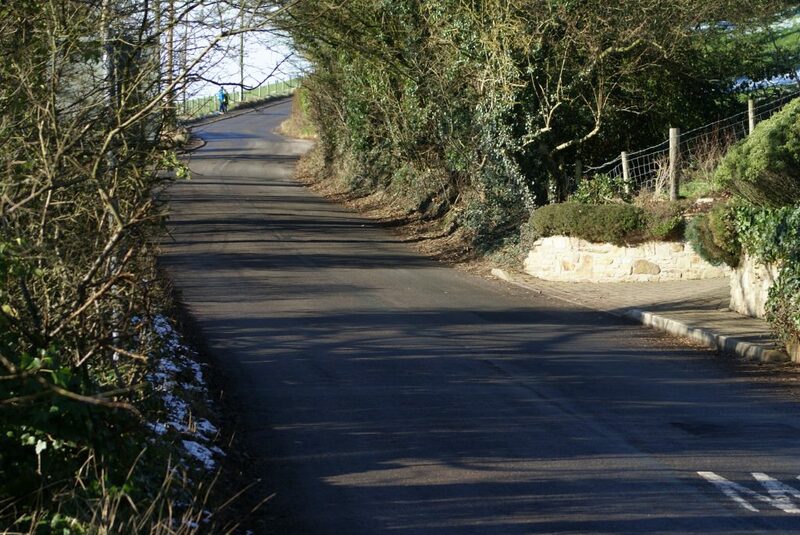 The route then leaves the open fell descending on farmland and tracks past Blindhurst Farm and continues on a track then farmland for the final 2 km. 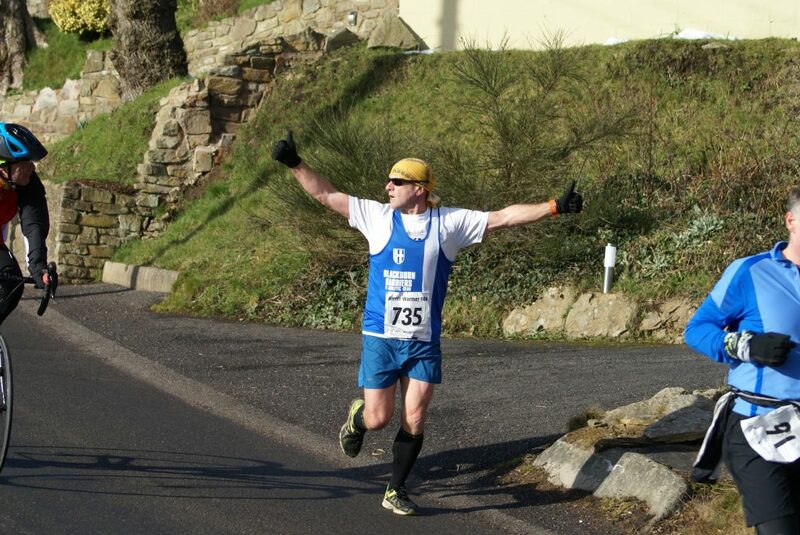 Over 900 finishers in this wind affected race won by Grant Johnson in a time of 70.37. 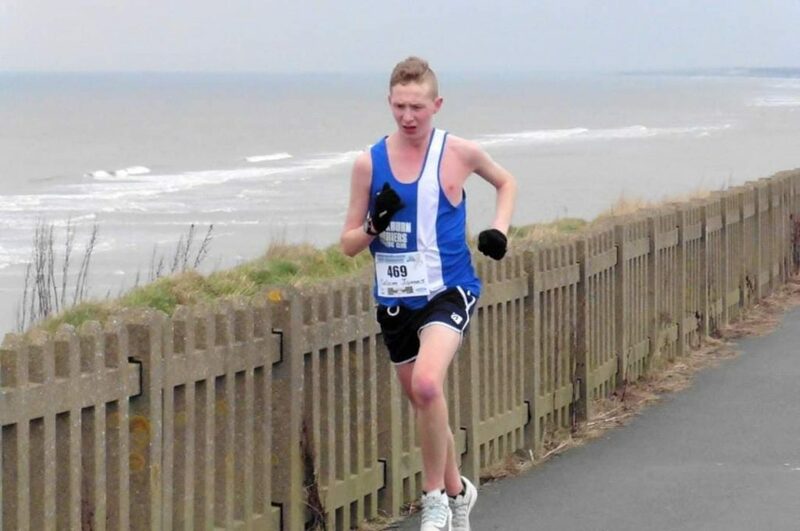 Calum Holmes came home 10th overall in 79.28 and there was little doubt that everyone’s times on the day had been affected by the conditions, with the wind blowing strongly off the sea. 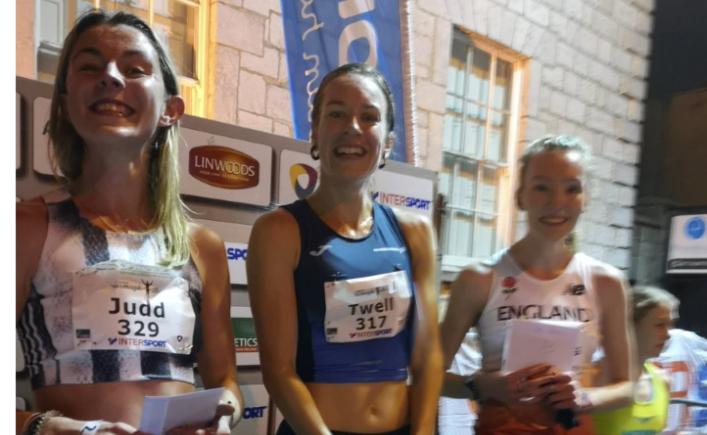 Fabulous racing at this years Armagh International Road Races as sixteen women ran under 9.30 with 49 women clocking sub 10 minute runs over 3k. 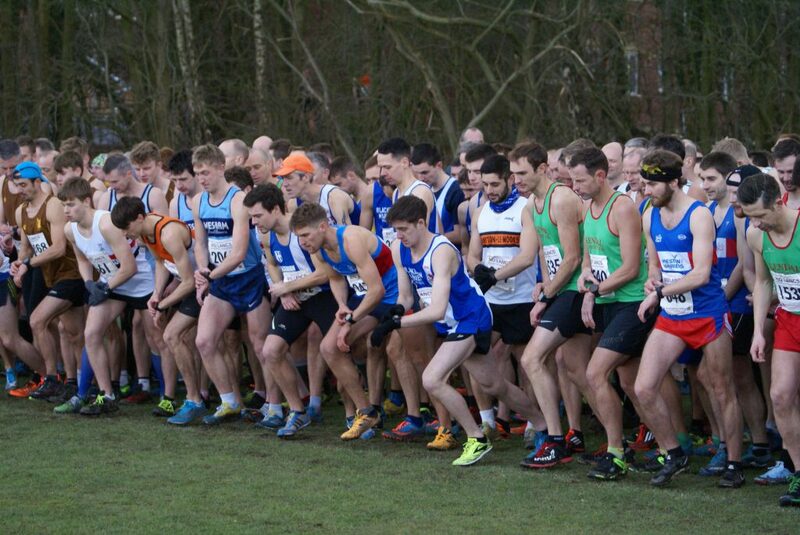 In the Men’s 5k Race, 113 ran sub 15 minutes overall – 12 of whom clocked sub 14 minute times. In 2018 Jess Judd clocked 9.03 in 2nd place to Laura Weightman at the Armagh 3k Road Race. 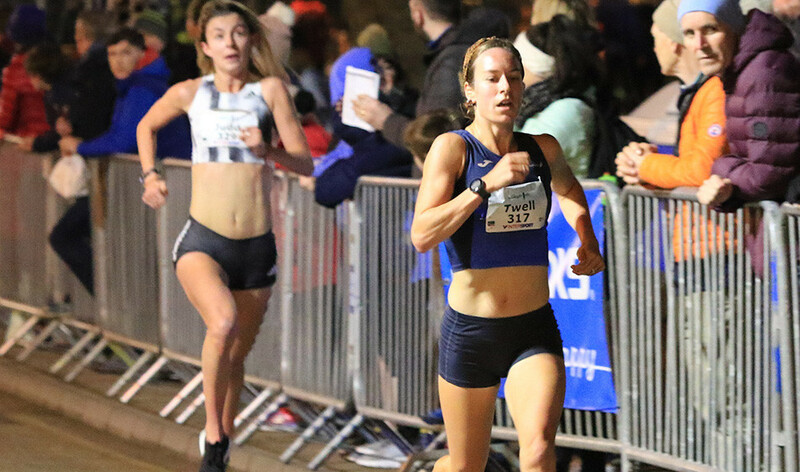 One year later, on Valentines Day 2019, she placed 2nd again, this time to Steph Twell (8.59) after running a great race herself in clocking a time of 9.05, just two seconds outside her presonal best. 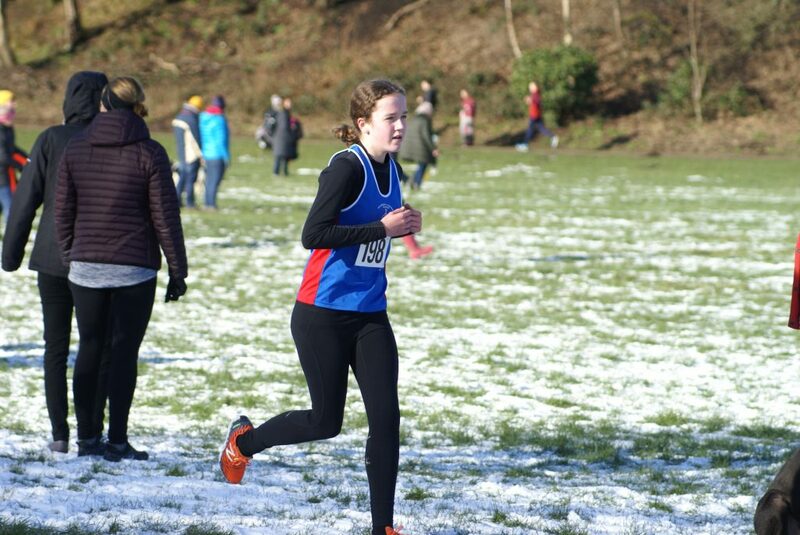 After the Race, Jess spoke to the Club saying “I’m really happy with my race, just not as fast as I’d like to be right now but it is difficult when training for the cross country and getting back from illness and injuries! Think I’m getting there but always nice to know I still have things to work on! 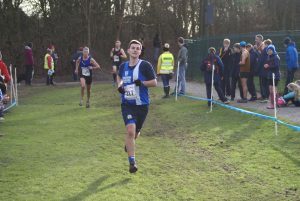 Really enjoyed the race and was nice to watch the mens race after too”. 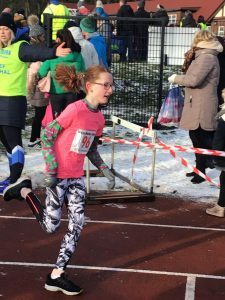 What a weekend for Blackburn Harrier – Holly Bradshaw. 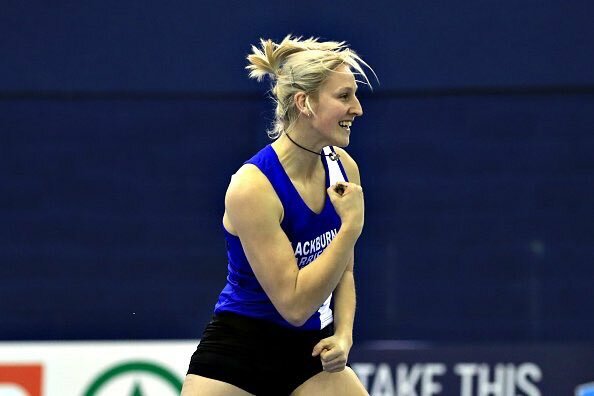 In her first competitive competition since since winning the Great City North Games back in September 2018, Holly, In winning the British Indoor Championships set a new Championship record and went to Number 3 in the World Rankings. 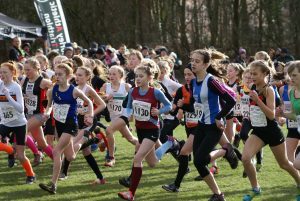 Another great day too for the Harriers as sixty athletes turned out. 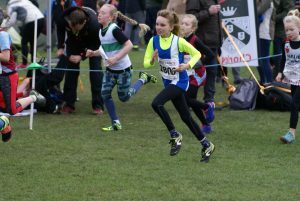 At the Mid Lancs League fixture at Leigh yesterday, they scored Team Wins in the U11 Girls, U13 Boys, U17 Men, Sen Women and Senior Men coupled with 2nd places for U11 Boys, U15 Girls and Senior Men’s Vet Team. 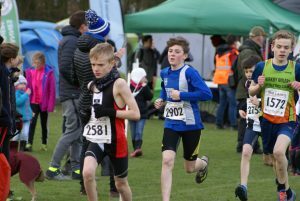 In the individual results there were wins for Isaac Butler in the U13 Boys, Matt Ramsden in the U17 Men and Chris Davies in the Men’s V40 age category with Mark Chippendale 2nd V50 and Joe Gebbie 3rd U20 Man. 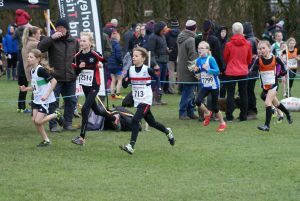 Seventy eight young girls lined up for the first race of the day which was for U11’s. 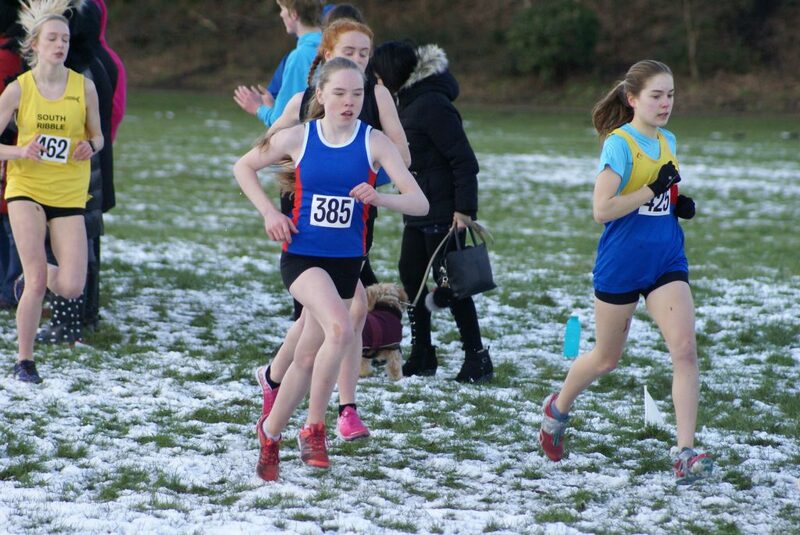 Eve Coulson who improves every time, led the Harriers home to the Team win as she placed 6th overall in a time of 8.42 after a battle down the home straight with Erica Corns (7th), both being given the same time. 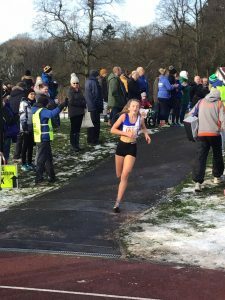 Imogen Robinson was just 3 places further back (9th) in a time of 8.44 with Hannah Davies the third counter for the team in 16th place (9.03). 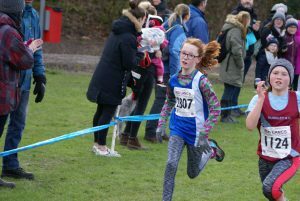 Another storming sprint finish by Charlotte Sousa saw her cross the line in 23rd spot (9.17) with Tippi Francis in 49th (9.56), Lulu Sharp in 60th position with a time of 10.28, Isabelle Pacelli (66th) with a time of 10.38 and 8yr old Charlotte Smith edging it in a flat out sprint (68th) running 10.46. 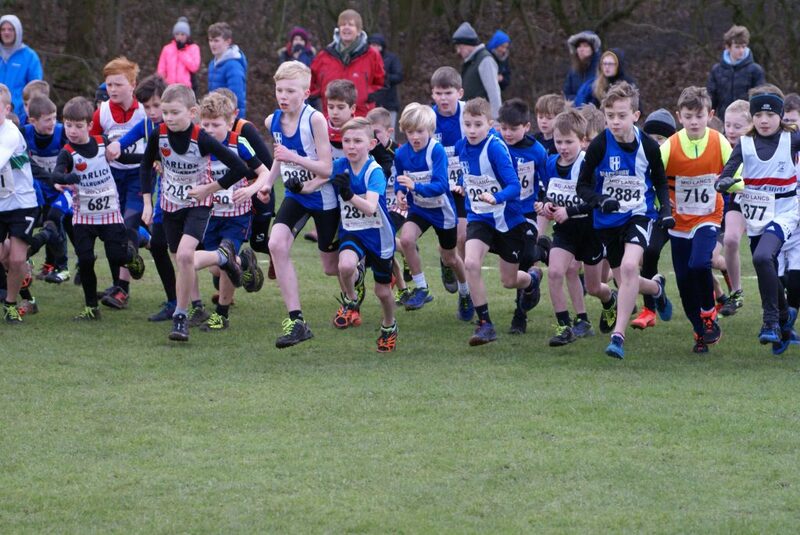 Eighty four U11 Boys in the next race where the Harriers (22 points) finished 2nd Team to Trawden (12 points). 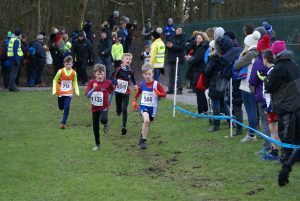 Coming into the home straight there was agood contest between Matthew Smith, Luke Ward (Southport) and Sam Aspey as they all strained for the 5th place – Matthew taking it in the end with a time of 7.41, Luke in 6th (7.42) and Sam in 7th (7.44). 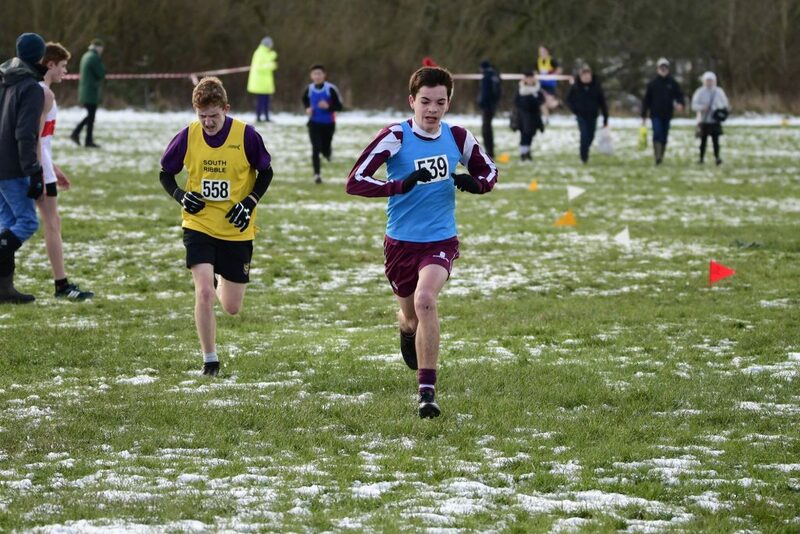 Ben Ham, running his first ever race for the Hrariers had an outstanding run to become the 3rd counter for the team in 10th place with a time of 8.07 which augers pretty well for his future. 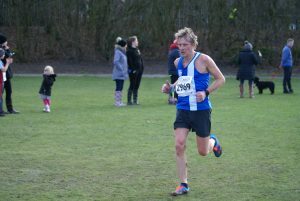 Next in was the ‘Blonde Bombshell’ that is Theo Robinson, clocking 8.20 in 17th spot with William Grundy just behind in 20th in a time of 8.26. 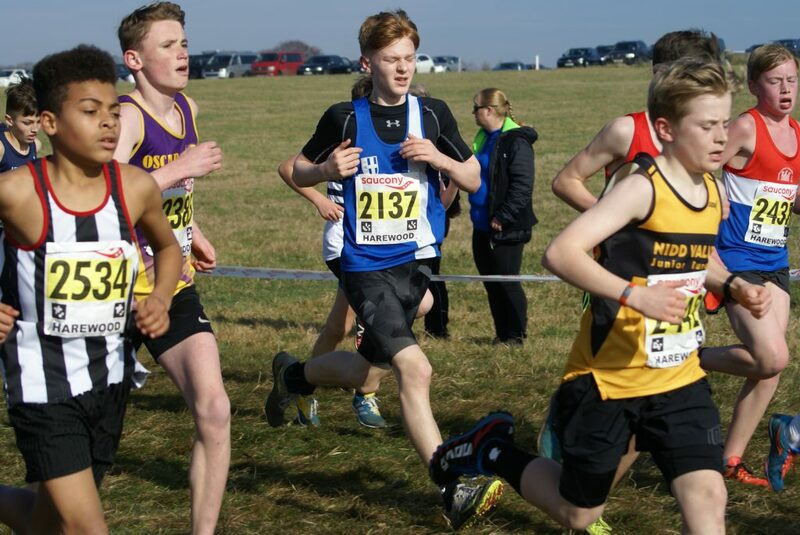 George Ramsden who is also an improving young athlete finished in 23rd (8.32) followed by Liam Bennison in 29th (8.43), Charlie Haworth in 46th place running a time of 9.02, Findlay Carroll (48th) clocking 9.05, Felix Thompson in 50th place (9.12), George Holman running 9.38 in 62nd, Alexander Brien in 67th (9.50) , Evan Potter in a time of 10.26 (75th), Harrison Waite 80th (10.53) and Isaac Smith in 82nd (11.08). 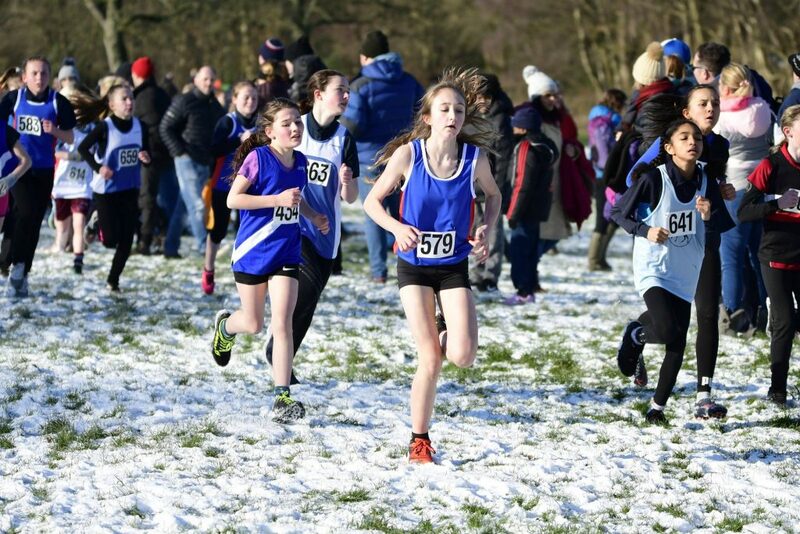 Short on U13 Girls on the day with just two athletes competing which saw Kate Cookson come home in 24th place out of the 48 girls racing in a time of 8.37 and Isabelle Hartley in 39th place (9.31). 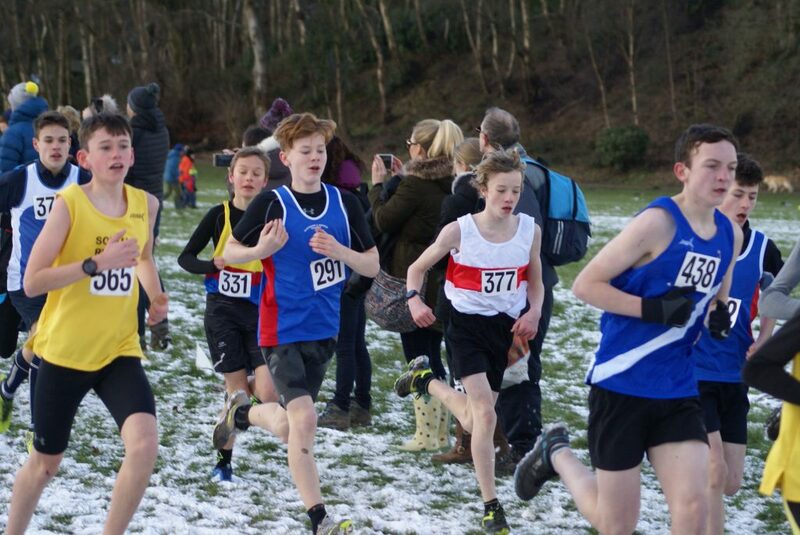 It was back to winning ways with the U13 Boys as they took the team 1st place with 19 points to Trawden’s 36 points in 2nd spot. 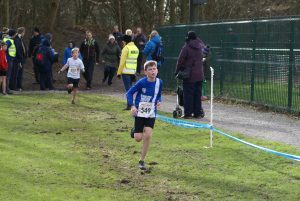 Isaac Butler set off with real intent and hit the front from the gun, holding the lead the whole way round to finish the comfortable winner by 10 seconds in a time of 9.17. 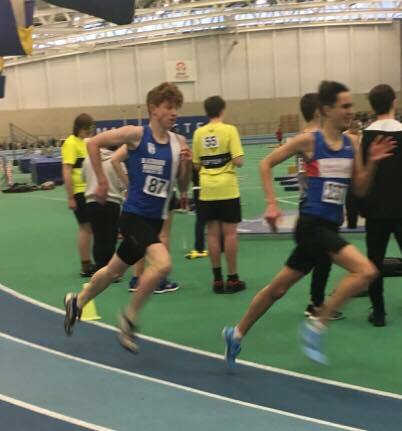 Dexta Thompson had another good race too, to place 6th overall in a time of 9.36 with Jonathan Brindle being the 3rd counter with a good run in 12th spot clocking 9.58. 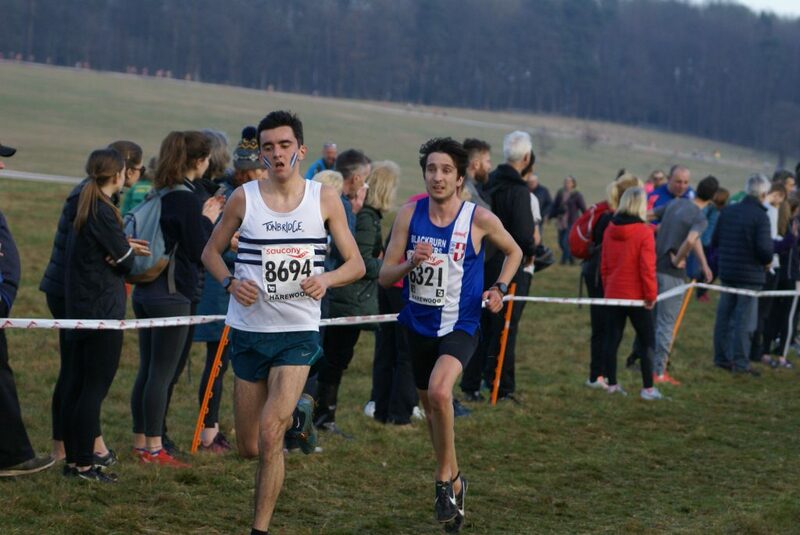 The consistency of performance for the lads showed when Daniel Smith came home next in 17th (10.14) and Codie Dewhurst in 19th (10.15). 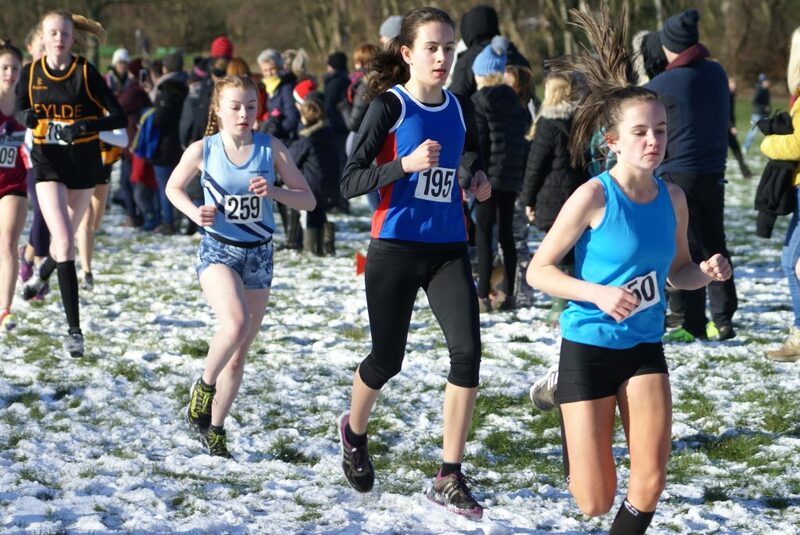 Our U15 Girls team (37 points) ran well to finish 2nd in the team race to Chorley (12 points) – Hollie Cubbon had one of her best races of ther season to be the first counter for the Harriers, taking 10th place in a time of 10.23 with Eleesha Charnley in 13th (10.29), Leah Hoole in 14th (10.35) and Ella Hardman in 33rd spot running a time of 12.30. 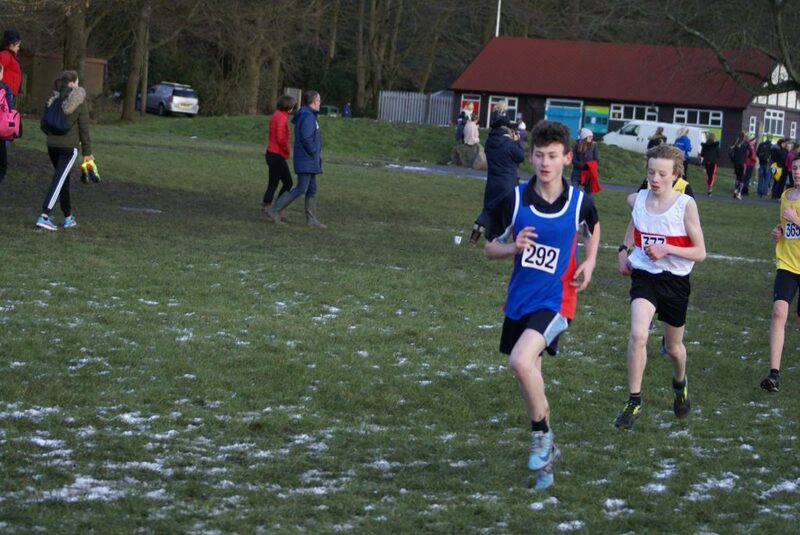 It was 4th place in the U15 Boys Race won by Kendal-Helm (Composite). 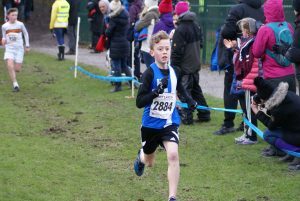 David Holman led the Harriers home in 10th place clocking 12.47 which was another good run following his 3rd placed finish in the Lancashire Schools Championships the previous week. 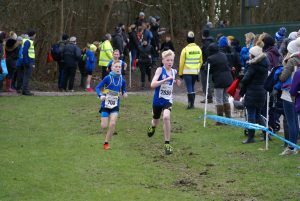 A solid run from Hayden Mercer saw him place 18th overall in a time of 13.33 with George Whittaker in 25th (13.55), Thomas Brooks in 27th (14.00), Danny Woodcock one place behind in 28th and given the same time of 14.00 and Rory Teare in 35th place (14.51). 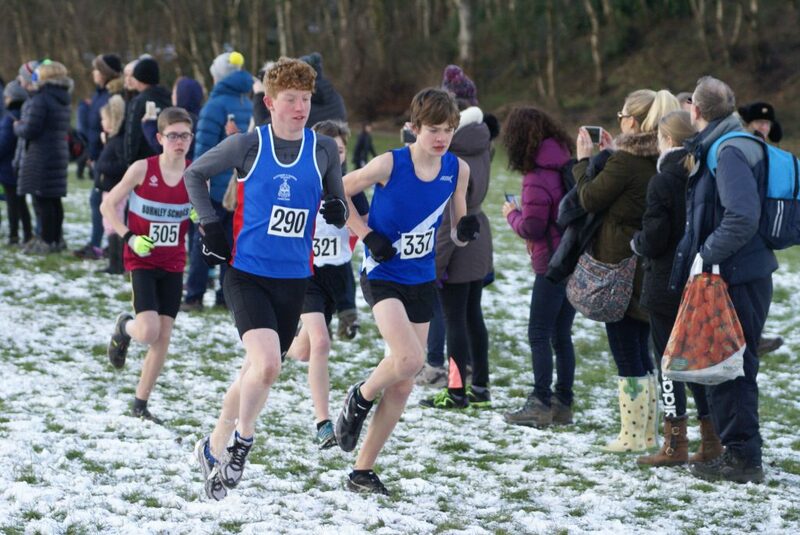 The U17 Men’s race provided another Team win for the Club as they scored 23 points to Rossendale’s 30 points in 2nd place. 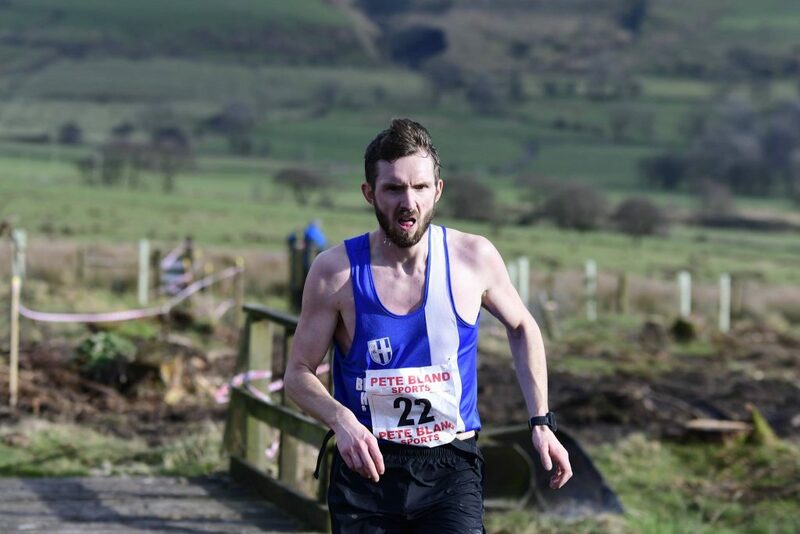 Matt Ramsden set off in 2nd place behind the Kendal athlete with Sam Hodkinson in 3rd. 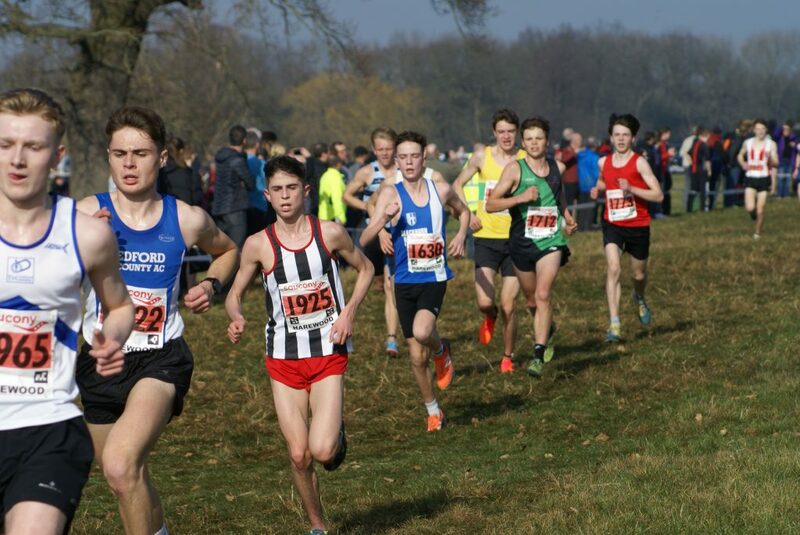 As the race progressed, Matt and Sam took it on to occupy 1st and 2nd places in the race and that is how it finished up with a really emphatic performance by Matt, winning in 17.20 with Sam in 2nd spot clocking 18.08 and Harry Wilkin (20th) in 20.58 who was the 3rd counter in helping the Harriers take the team win. 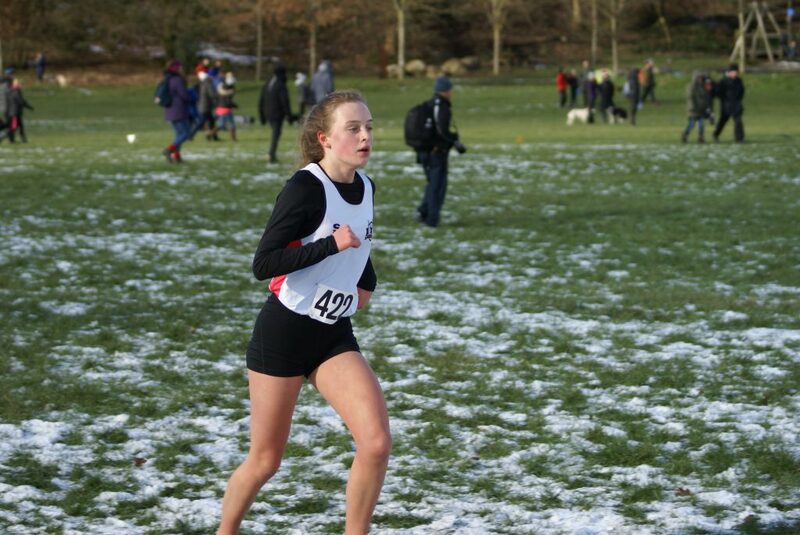 Amy Davies ran a time of 13.59 for 5th place in the U17 Women’s race. 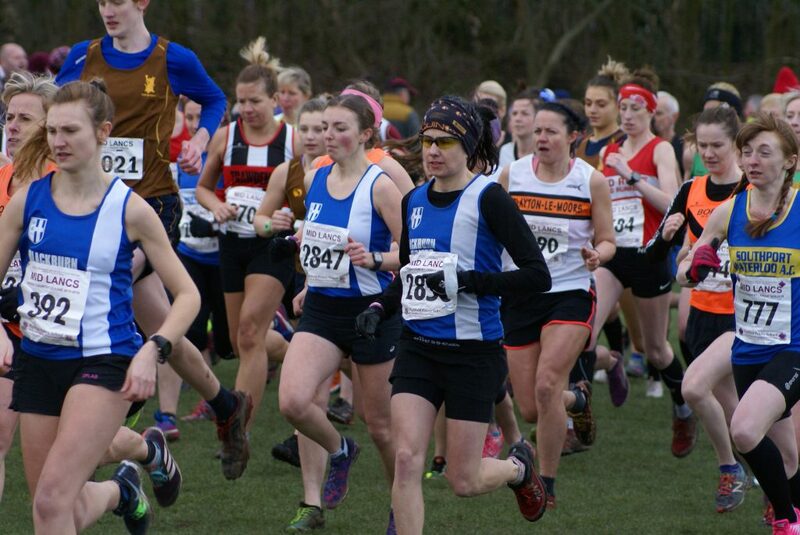 The Senior Men and Senior Women teams following their win at the previous Mid Lancs fixture at Towneley Hall backed that up here at Leigh with another double headed win. 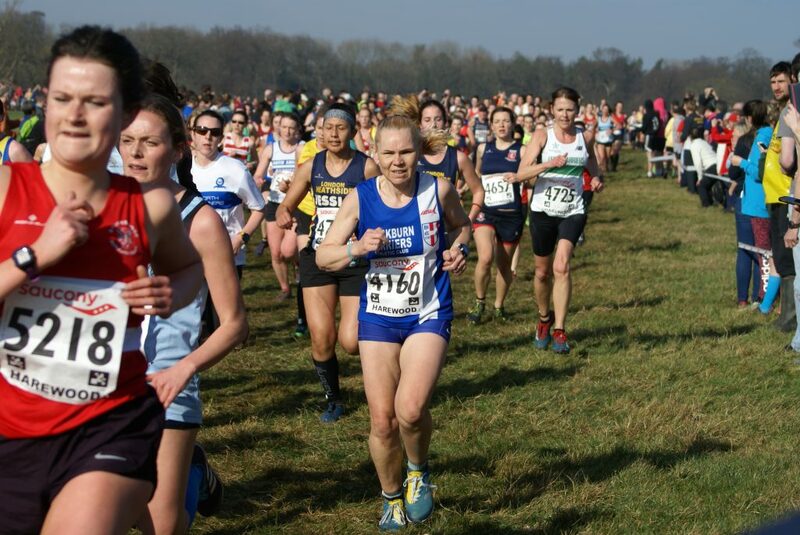 The Senior Women’s race saw the Harriers get their three counters across the line in the first eleven places and led by Annabel Ralph who set off right at the front of the Race and finished 3rd overall in a time of 19.59. 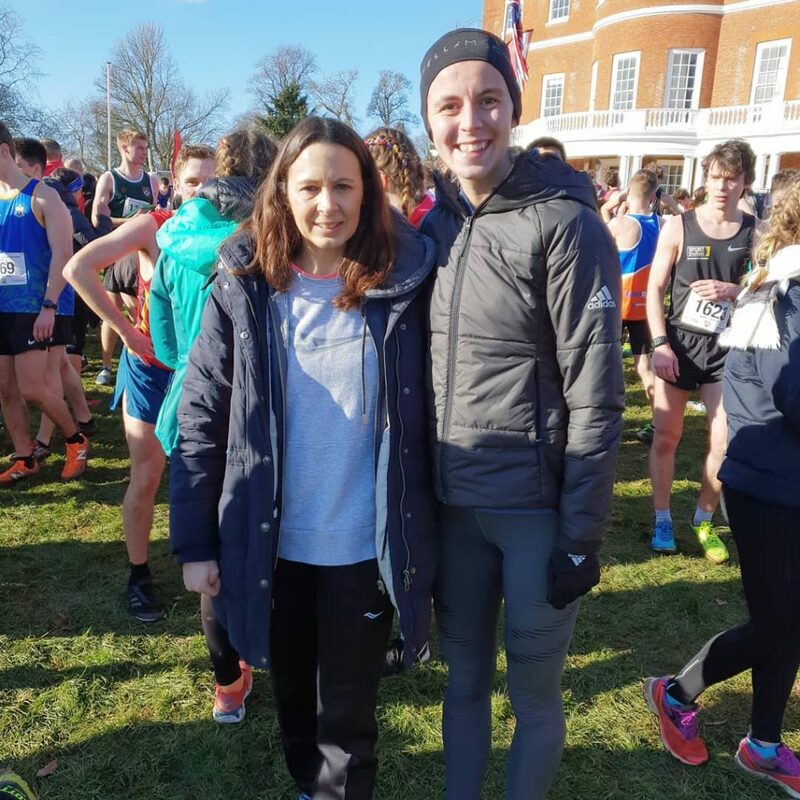 Great support from Carmen Byrne who crossed the line in 7th place in a time of 21.11( 3rd V35) and Ellen Sagar-Hesketh in 11th running a time of 21.34. 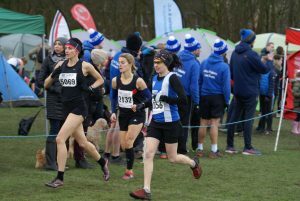 Lindsay Davies was next home in 40th (23.58) and followed by Michelle Teare (85th) out of the 155 strong field clocking 26.58 with Nicola Hartley and Helen Dawson-Smith both clocking 28.28, finishing in 114th and 115th places respectively. 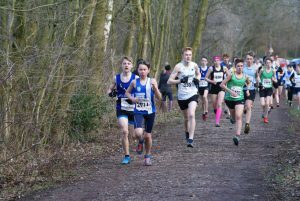 The Senior Men’s race featured two hundred and fifty one runners and was won by Rob Danson in 32.02 with Luke Minns in 2nd (32.23). 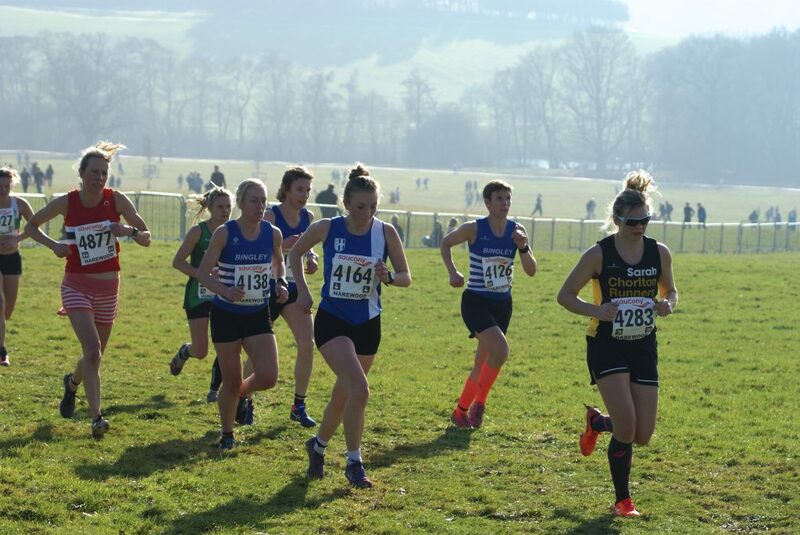 The Harriers had their six counters all home in the first 25 places which saw them take the Team win with 96 points from Lancaster & Moreambe in 2nd (110 points). 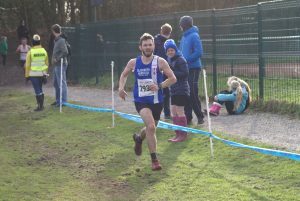 Marc Hartley had a really good run (33.44) to place 7th overall, supported by Tom Blaney in 11th with a time of 34.36 and just outkicking Chris Davies in 12th (34.38) who also won the V40 age group category along with Jacob Watson also having a good run in 17th spot (35.03). 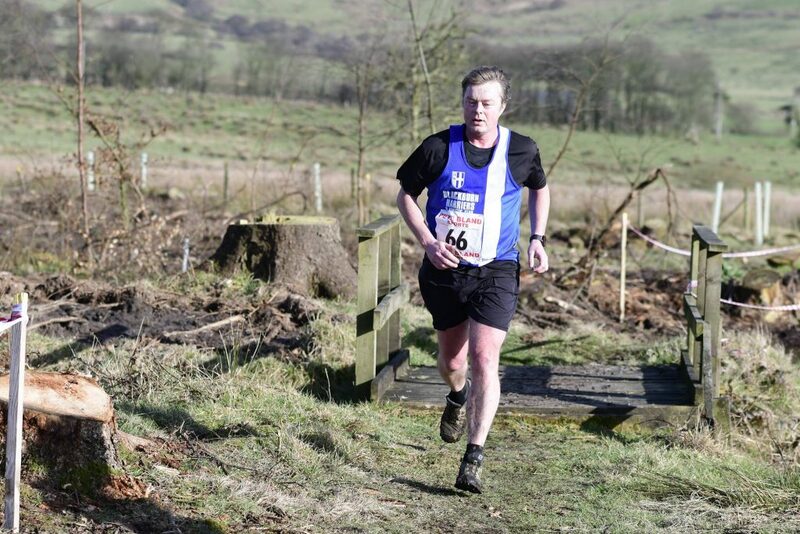 Next Harrier across the line was Mark Chippendale with a strong run clocking 36.19 in 24th place and 2nd V50 on the day, followed home by Joe Gebbie just one place behind (25th) and 3rd U20 man on the day in a time of 36.21. 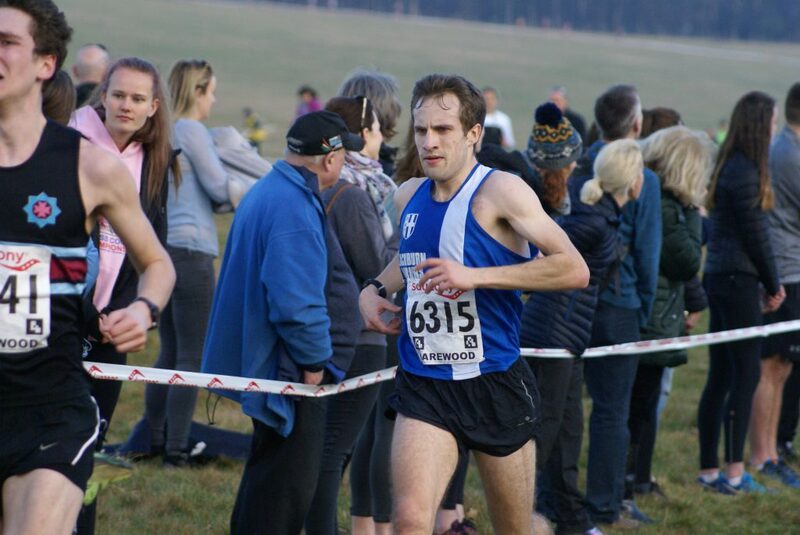 John Horrocks was next home for the Club with a pretty solid run of 37.11 in 38th place with Danny Maynard in 108th in a time of 40.51, V50 Chris Balderson in 113th (41.20) and Allan Hartley in 223rd place (49.37). 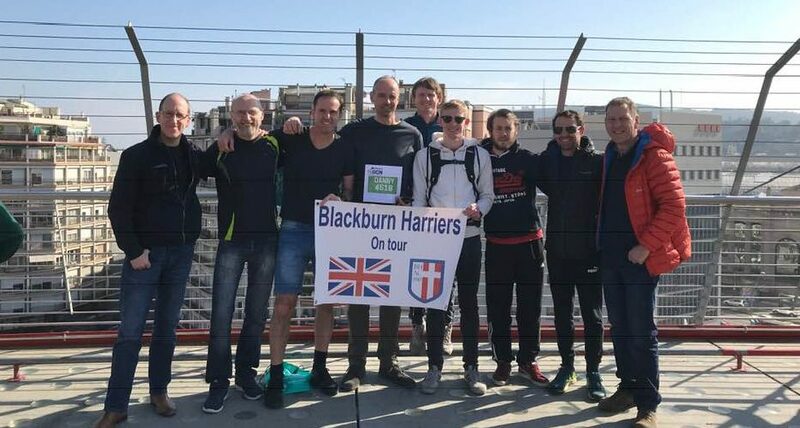 The Harriers went on tour at the weekend, this time to sunnier climes, as they took on the famed Half-Marathon in Barcelona. 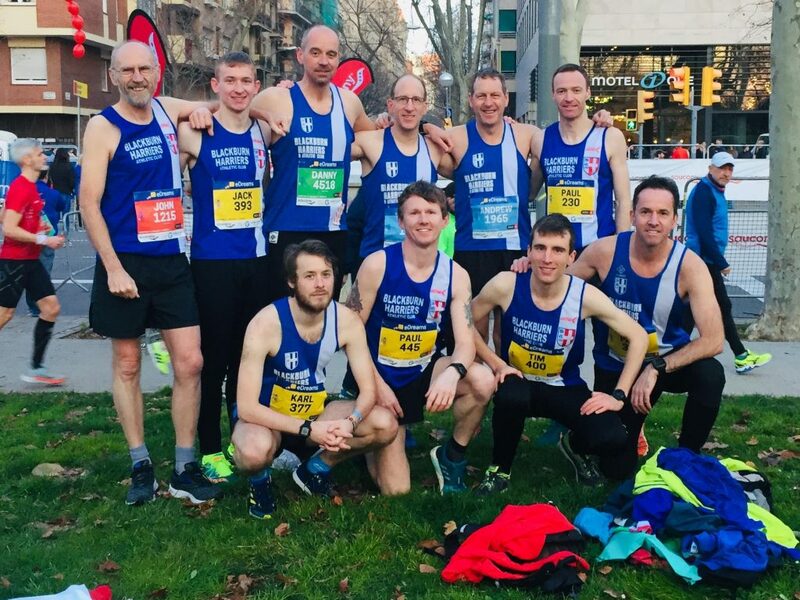 Looking for new personal bests, the lads certainly delivered with Team Captain Paul Guinan “What a great weekend with Blackburn Harriers, a brilliant race in a fantastic city, great times by the guys, loved every minute of it, we are the in a great place at present and I’m so pleased I’m a part of this. 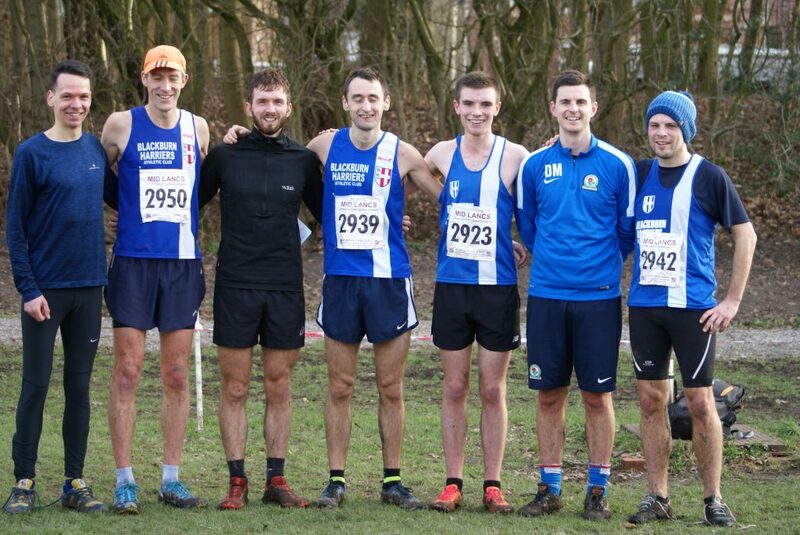 The lads have done us all proud, we have a very special group of runners”. 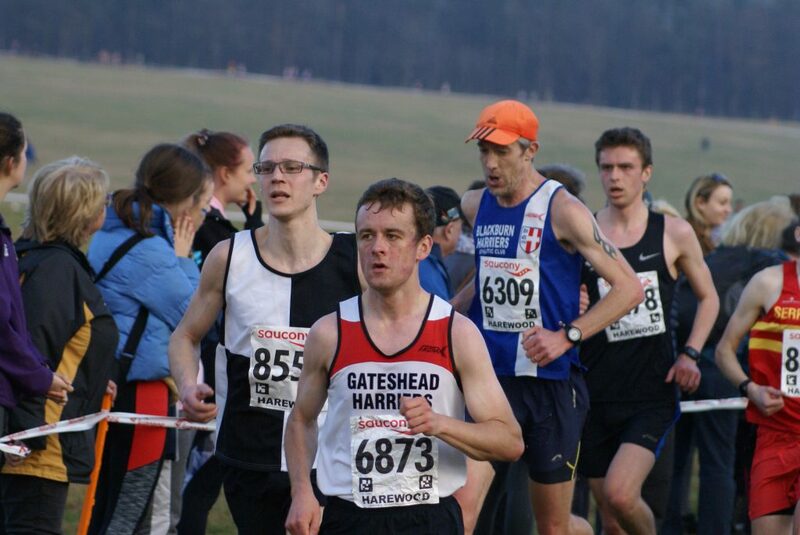 Tim Raynes had a fabulous day as he led the Harriers home in the race which featured thousands. 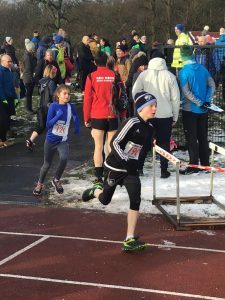 Tim clocked a big new PB as he placed 59th overall with a time of 68.40 reducing his previous best time (70.39) by some two minutes. 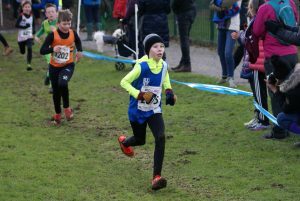 Jack Hindle was the next Harrier firing on all cylinders, as he too, set a new PB clocking 72.44 (151st) – an improvement by a full minute. 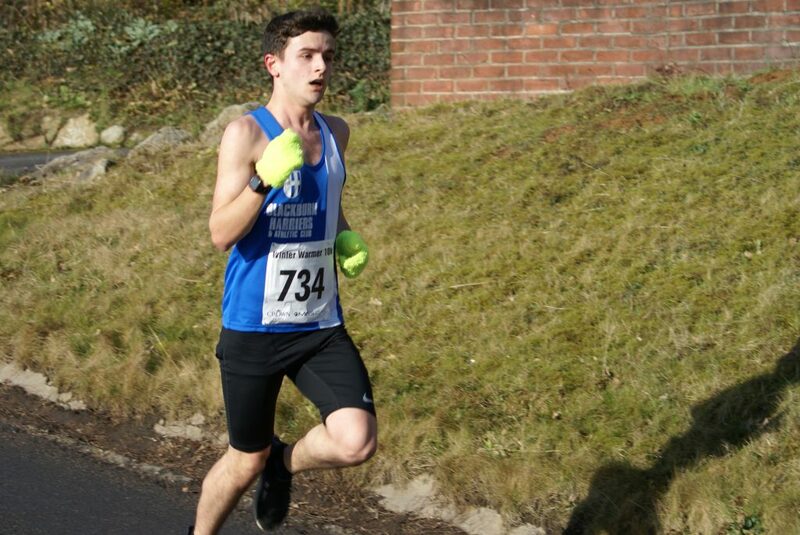 Karl Billington made it the third new PB of the day coming home in 187th position with a time of 73.58 in only his second ever half-marathon and an improvement by nearly 10 minutes over the time clocked in his first half of 83.13 run in 2016. 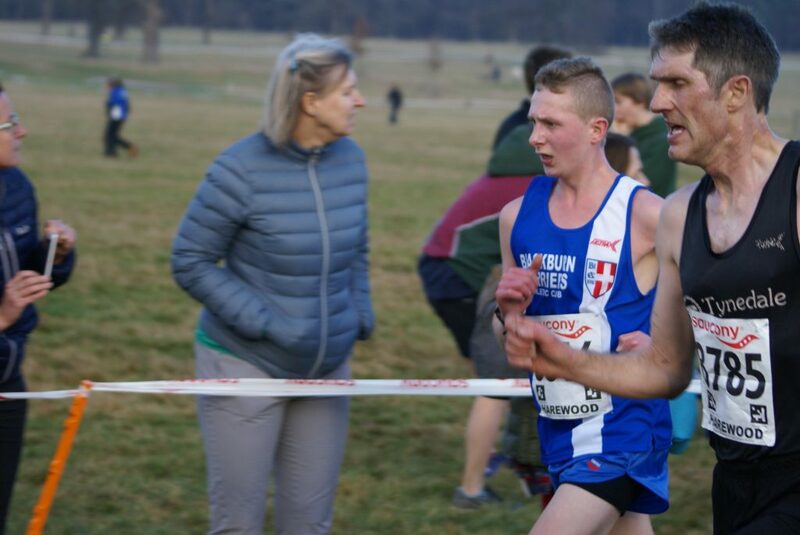 Yet another new PB, this time from Paul Bradshaw as he chopped nearly two minutes off his previous best of 79.59 to clock 78.08 in 409th place. 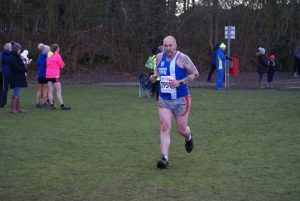 Team Captain Paul Guinan was next through the line in a time of 84.18 (1030th), followed by V60 John Chaplin with an excellent time of 87.45 (1506th). 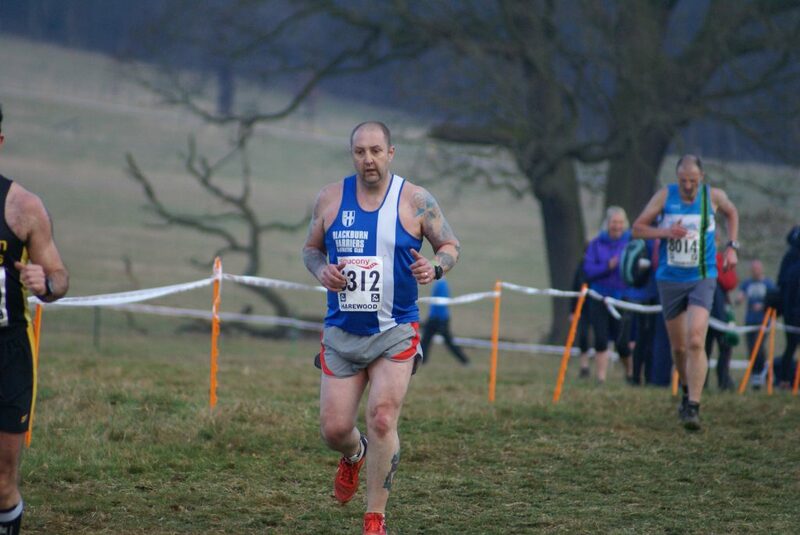 This run by John puts him in 2nd place in the National V60 Rankings which is a fabulous achievement. 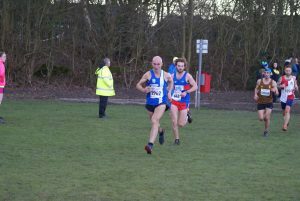 Just a couple of minutes behind John came Paul Brindle who ran a time of 89.27 (1895th) followed by John Cookson (3591st) in a time of 97.16 for the 5th new PB of the day as he shaved over half a minute off his previous best time set in 2016. 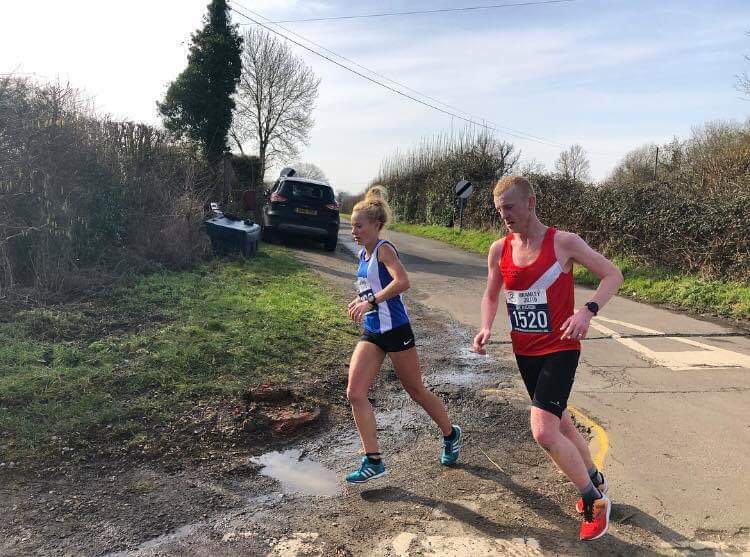 A minute further back came Andrew ‘training for an Ironman’ Knowles in 4013th position clocking 98.36 and Danny Teare who made it six new PB’s on the day with his time of 1hr 48.18 – sixteen seconds faster than his best to-date and in 6386th spot. 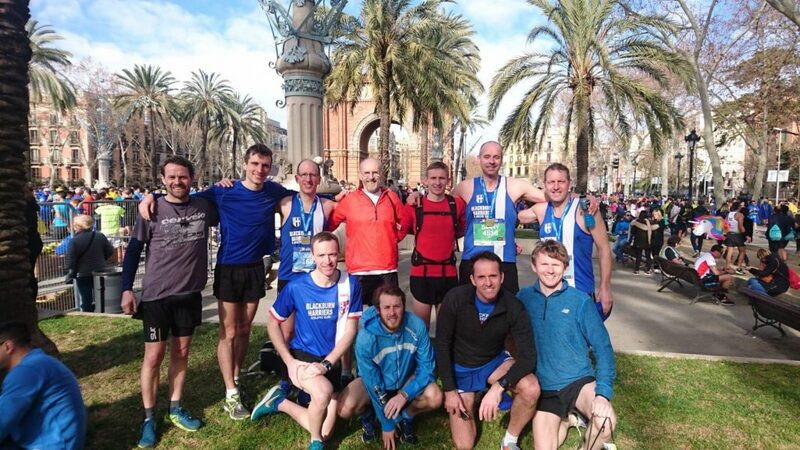 Karl Billington “Great race at Barcelona couldn’t ask for a better for a better half. 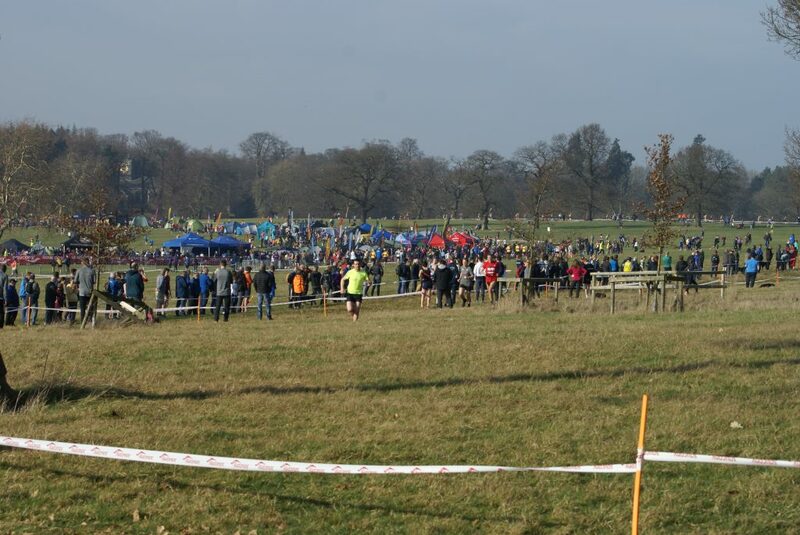 Great course, well support and great conditions. 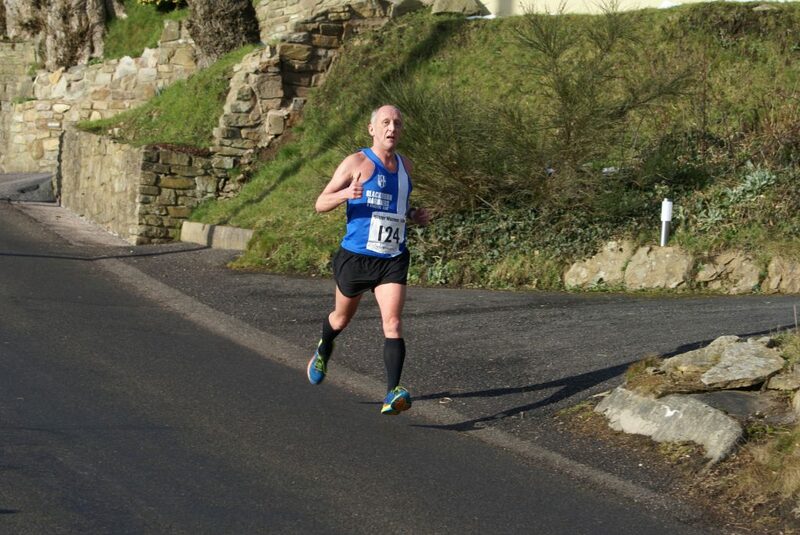 Happy with a 9min PB. 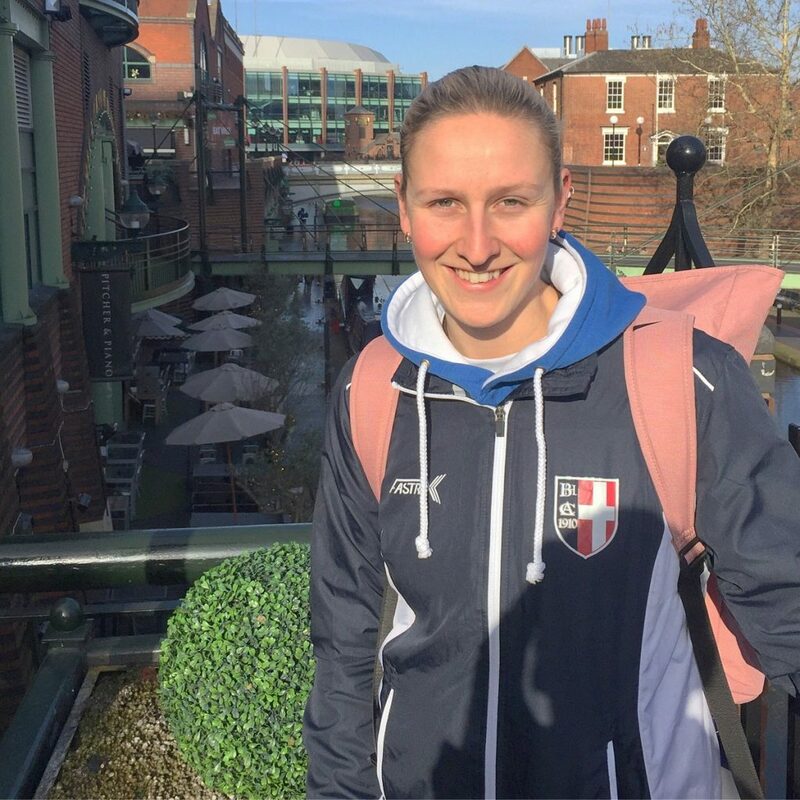 Shout out to El Capitan guiny for the organisation”. 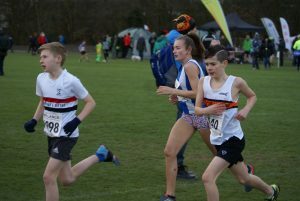 U15 Ben Boocock and U17 Myah Booth were racing at the latest of the Indoor Meetings held at Sportscity over the weekend. 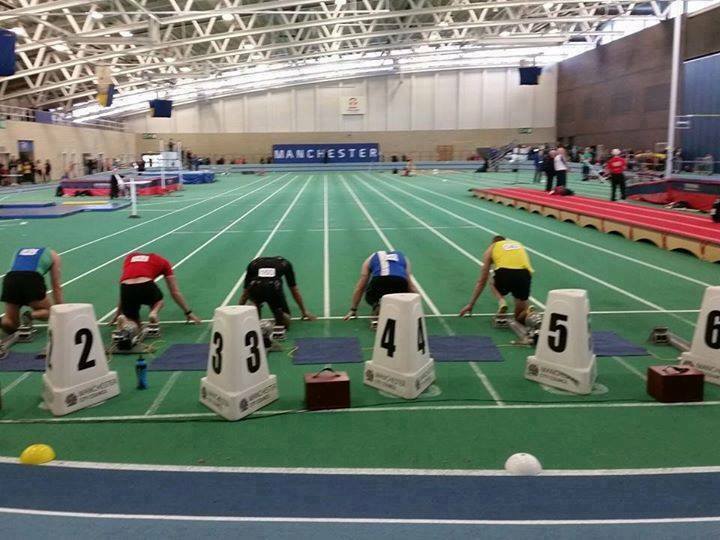 Benran the 60m, a distance which he hasn’t raced previously and had a great run, placing 2nd in a time of 8.14. 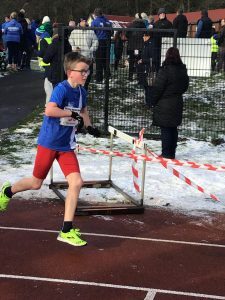 His second race of the day saw him equal his Silver Medal run in the Northern Championships recently over 60m Hurdles, as he clocked 9.24 to win his Heat. 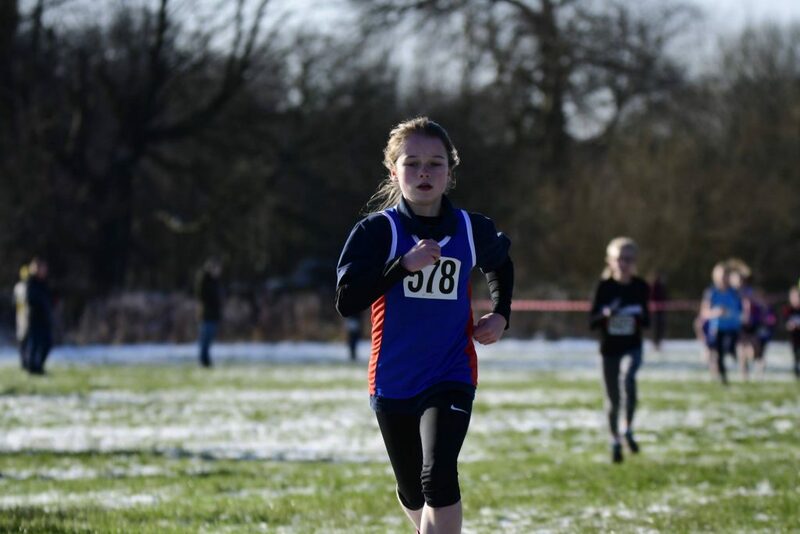 U17 Myah Booth also ran the 60m Hurdles finishing in 2nd place in her Heat with a time of 9.46. 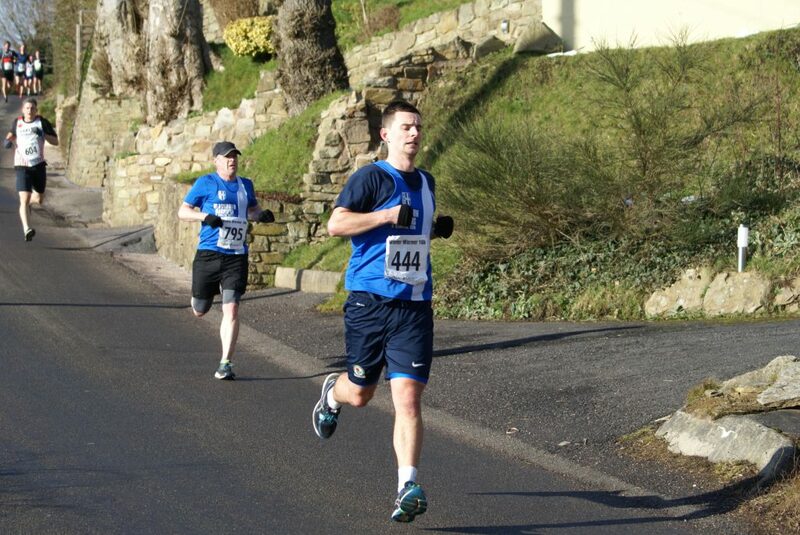 Calum Holmes ran in the Valentines 10k this morning won by Karl Darcy in a time of 31,43. 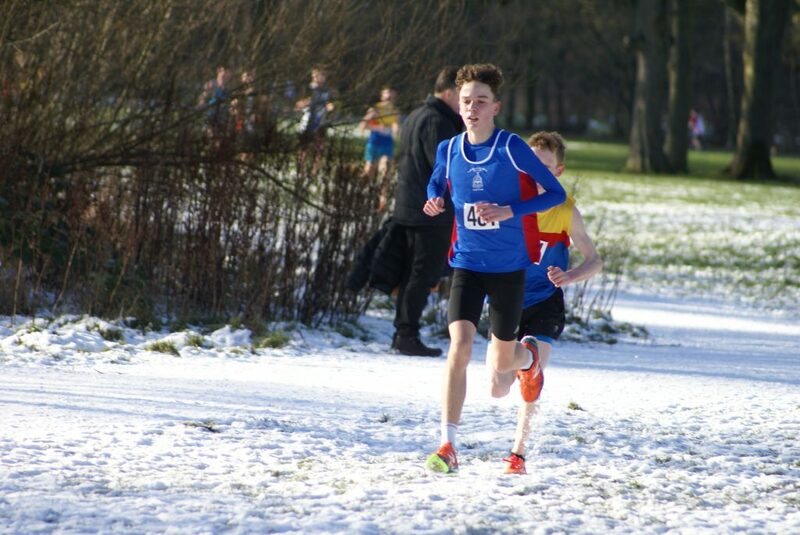 Calum Holmes came 6th out of field of 256 runners, clocking a time of 36.09. 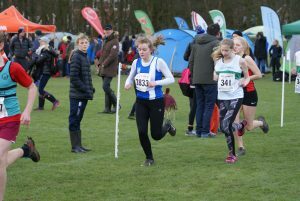 This years Lancashire Schools Cross Country Championships were in doubt right up to the last minute, but thankfully they went ahead and saw some good championship running as a result, with qualification places for English Schools up for grabs. 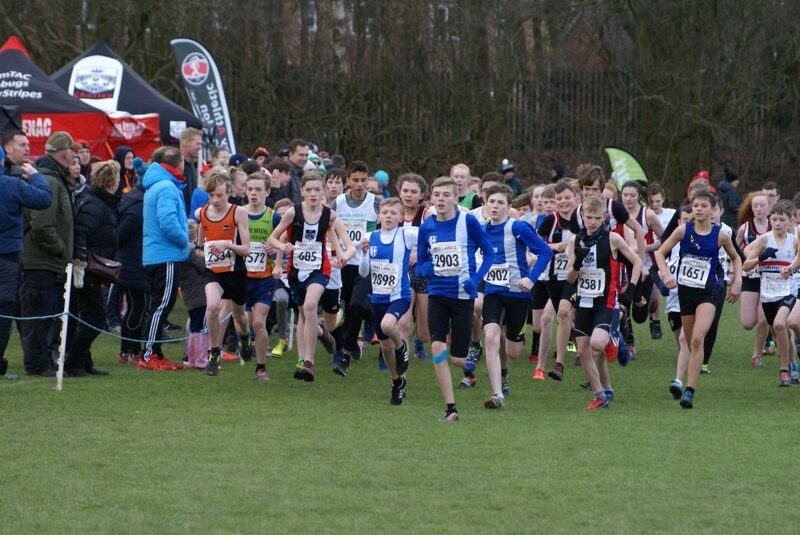 Thirty four athletes from Blackburn Harriers qualified for the championships. 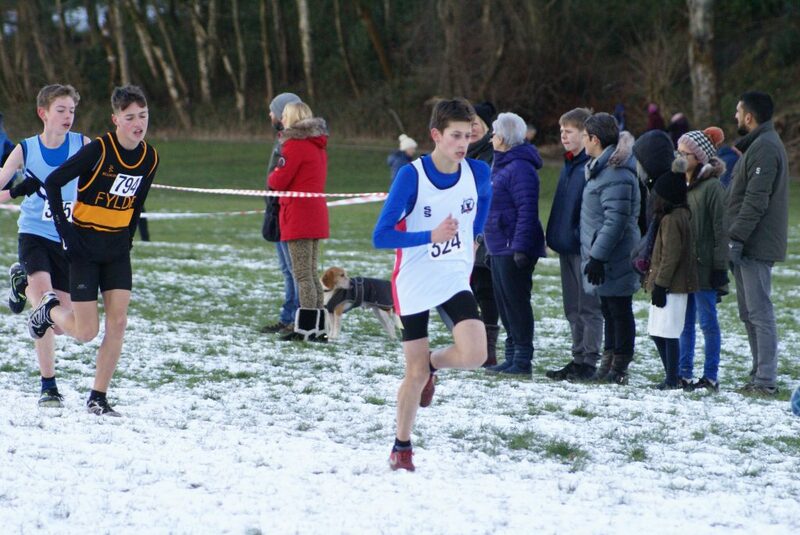 Highlight of the day for the Harriers was the Title winning run of Matt Ramsden in the Inter-Boys race featuring 54 runners. 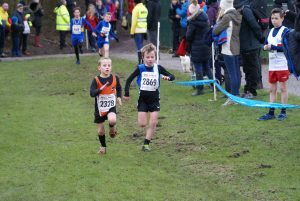 Matt (Blackburn) and Rhys Ashton (Lancaster) battled it out the whole way round with Matt keeping a one to two metre lead only. 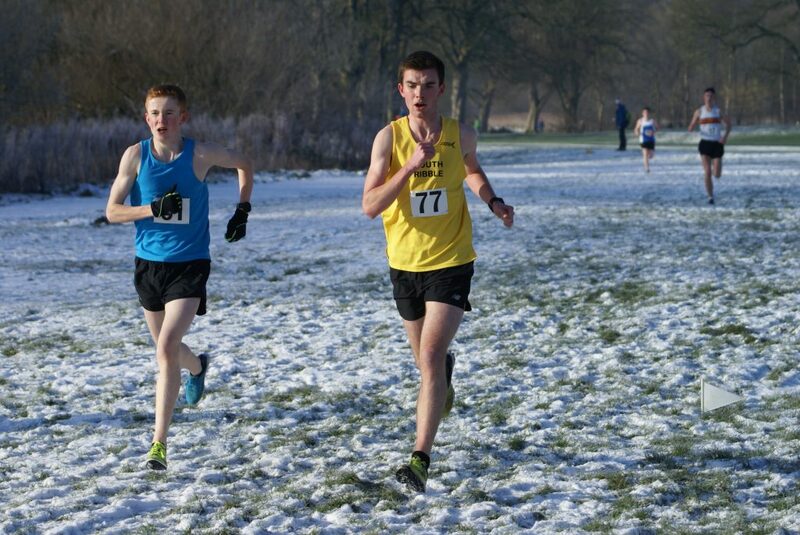 With around 500 metres to go, Matt went for the finish and came home a confortable winner in the end by 5 seconds (18.14) from Rhys in 2nd place (18.19) and Max Cunningham (Rossendale) in 3rd (18.23). 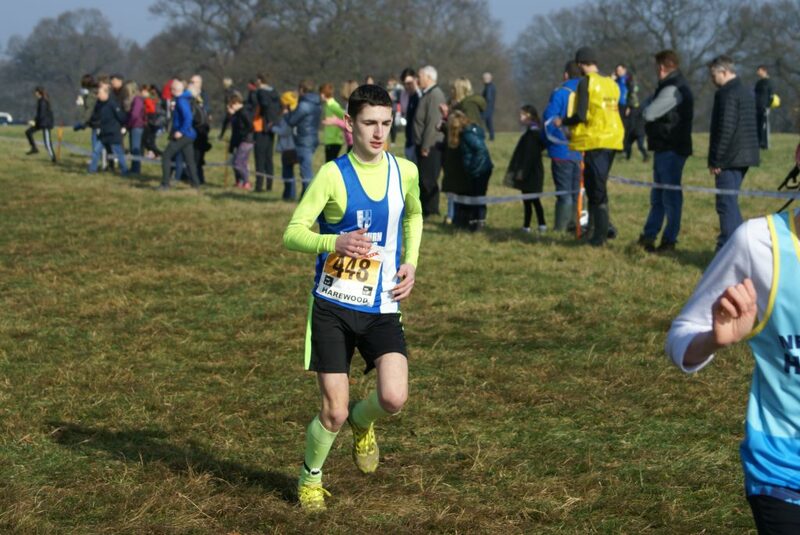 Sam Hodkinson (South Ribble) placed 7th in 19.10 and just missed out on a top 6 finish. 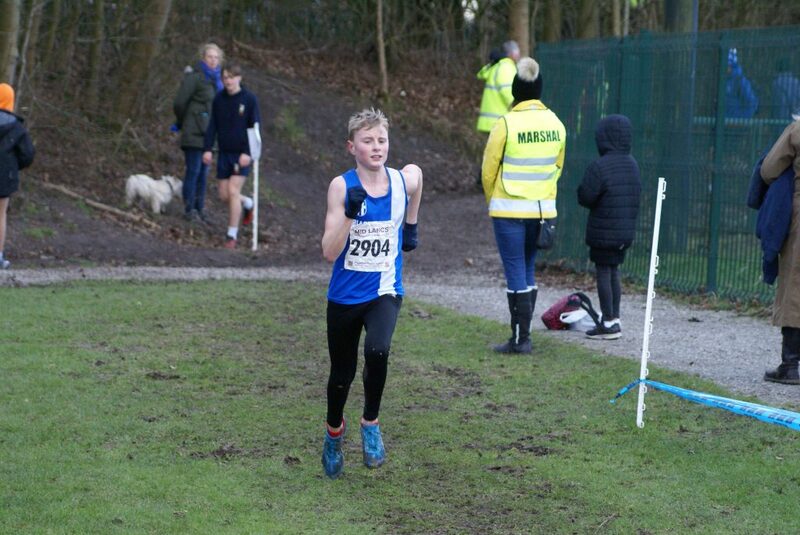 Harvey Ashworth (Blackburn) ran a very good first lap but faded slightly on the 2nd lap, costing him places as he came home in 21st (20.47) with Ethan Barbarewicz (South Ribble) and Sam James (Preston) in 45th position (23.34). 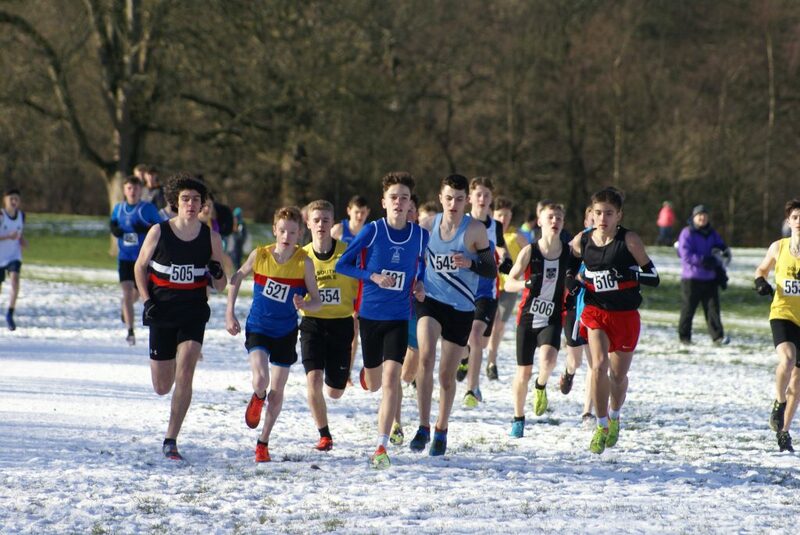 In the Senior Boys Race – Joe Gebbie (South Ribble) finished 10th (25.31) in a race won by Kian Davis (23.34), a race which saw just 11 seconds separate the first four athletes. 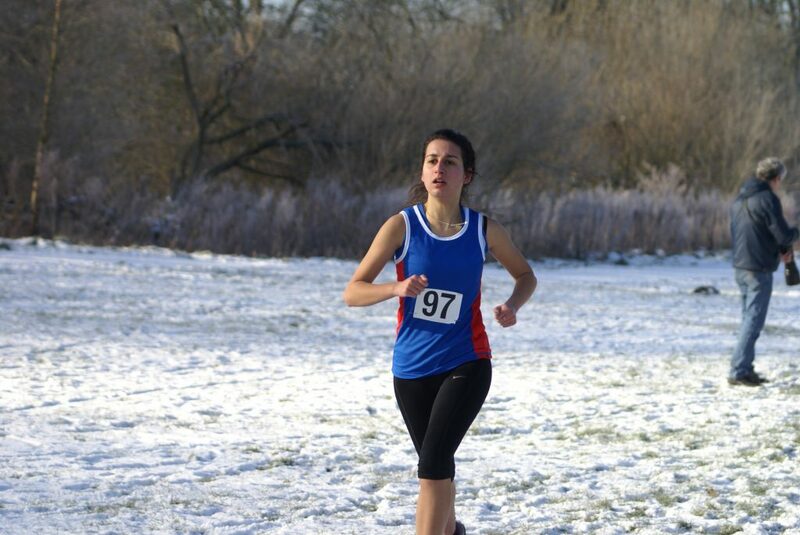 Hannah Cookson contested the Senior Girls race clocking 18.05 in 10th spot. 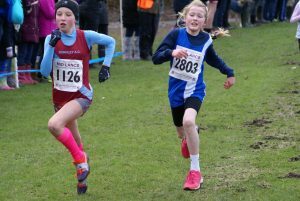 Fifty nine ran in the Year 7 Girls race won by Charlotte Wilkinson (Chorley) in 8.38. 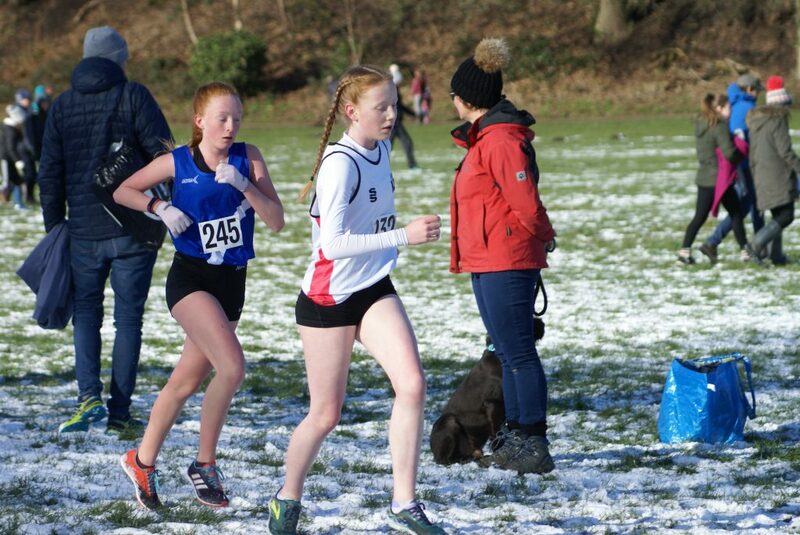 Amelia Burton (Hyndburn) had a good run to place 16th in a time of 9.47 with Lucy Rishton (Blackburn) not far behind in 18th place (9.53) and Isabelle Hartley in 23rd (10.07). 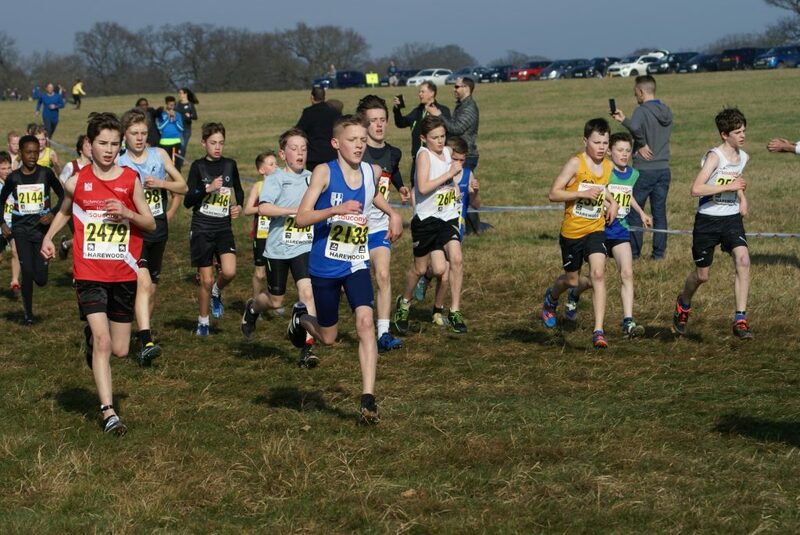 An even bigger field in the Year 7 Boys race with 69 nine runners competing in the race won by Jack Lamb (Chorley) in 8.04. 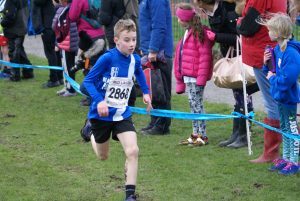 Highest placed Blackburn Harrier running for South Ribble, was Daniel Smith with an excellent performance of 8.29 in 5th place and first counter for South Ribble who placed 2nd in the team race. 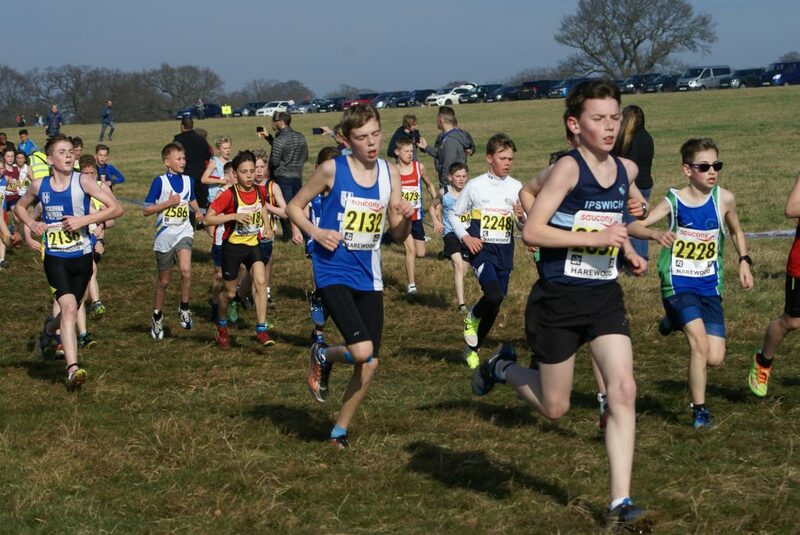 Ben Livesey (Blackburn) came home in 32nd position with a time of 9.11 with Harry Sambrook (Blackburn) in 39th (9.17). 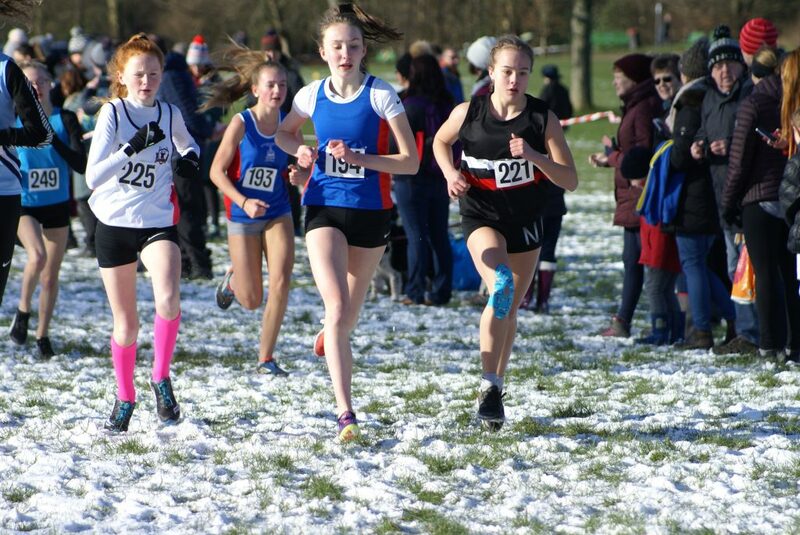 Hollie Cubbon (Blackburn) had a good race too in the Junior Girls Race won by Ava Lloyd (West Lancs) in 13.07. 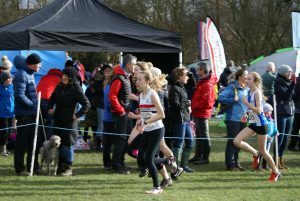 Holly came home in 10th spot out of the sixty three strong field in a time of 14.18 with Leah Hoole (Blackburn) in 16th place (14.49), Kate Cookson also Blackburn in 20th (15.09), Eva Knowles (Blackburn) clocking 15.24 in 29th place, Keira Haxton (Hyndburn) 40th in 15.51, Caroline Woodworth (Hyndburn) 50th in a time of 16.14 and Lucy Ramsden (Blackburn) running 16.52 in 56th spot. 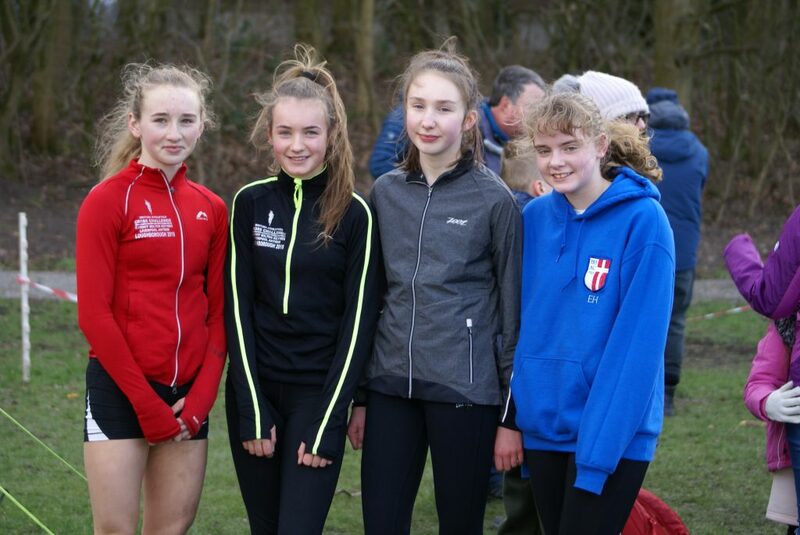 Hollie, Leah, Kate and Eva were all counters for the Blackburn Team which finished 2nd to the winners – Chorley. 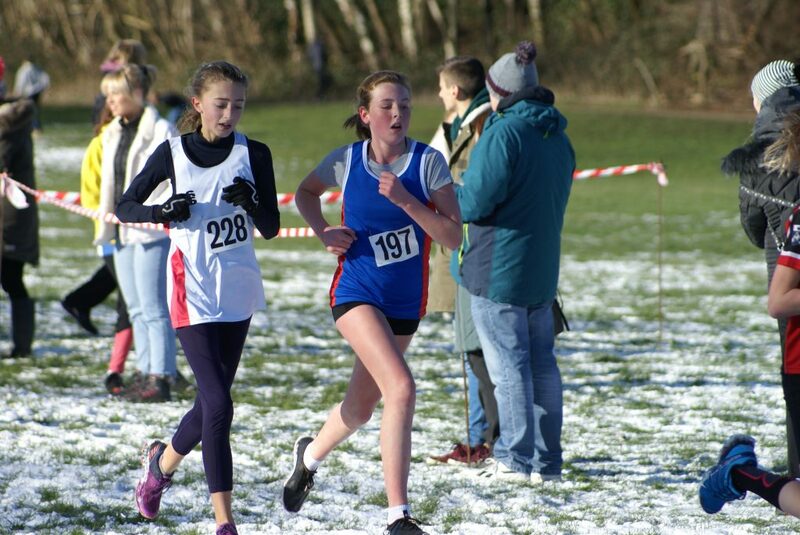 Amy Davies (Blackburn) took 4th pace in the Inter-Girls Race won by Darcy Lonsdale (Fylde) in a time of 15.18. 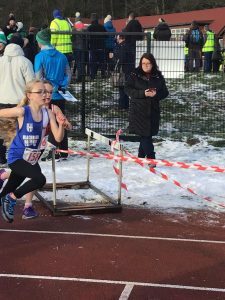 After being part of the leading group of four over the first lap, Amy got slightly detached and clocked 15.45 with Eleesha Charnley (Hyndburn) working her way through the field, not far behind in 7th with a time of 15.58, Ruby Cain ((Blackburn) in 30th place (18.22) and Rebecca Ramsden (Hyndburn) 32nd in a time of 18.26. 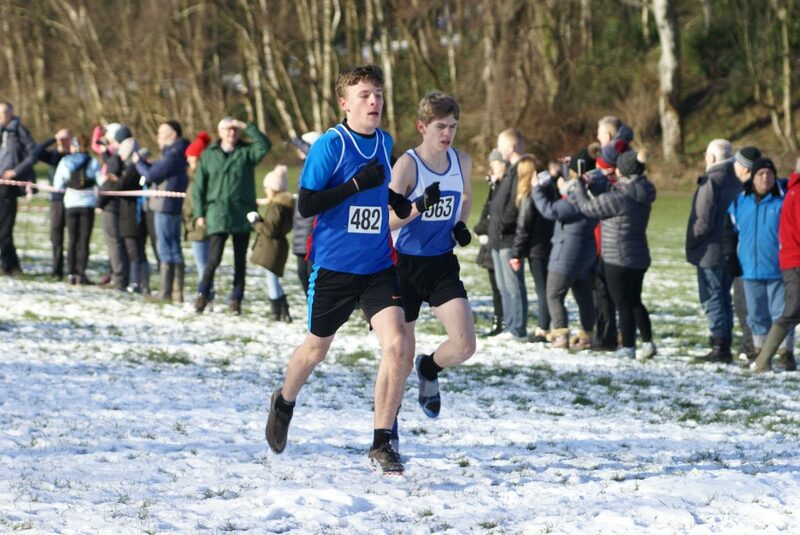 The Junior Boys race was won by Luke Rawcliffe (Fylde) after a tremendously close run race with Tobias Swarbrick (Lancaster) which saw both boys given the identical time of 14.20. 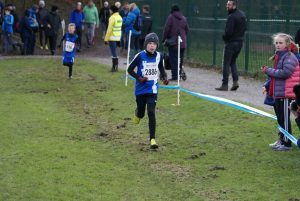 There was a top run too for David Holman (Hyndburn) who had his best cross country race of the season as he placed 3rd in a time of 14.31. 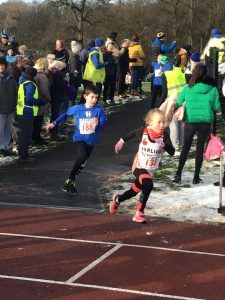 Next Harrier home was Dexta Thompson (Rossendale) in 9th spot clocking 15.05 with Hayden Mercer (Blackburn) one place further back in 10th (15.13). 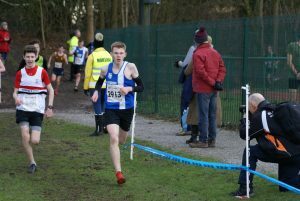 Kyle Taylor-Pomfret (South Ribble) finished in 19th out of the 59 runners in 15.36 with Theo Watson (Blackburn) in 22nd place (15.40), and just one place behind – Jack Paget-Fowler (Blackburn) in 23rd (15.41), Joe Joyce (Chorley) in 28th spot (15.50), Codie Dewhurst (Blackburn) 30th running 15.56, Sebastian Burton (Hyndburn) clocking 16.11 in 33rd and Saul Sharp (Hyndburn) in 35th (16.16). 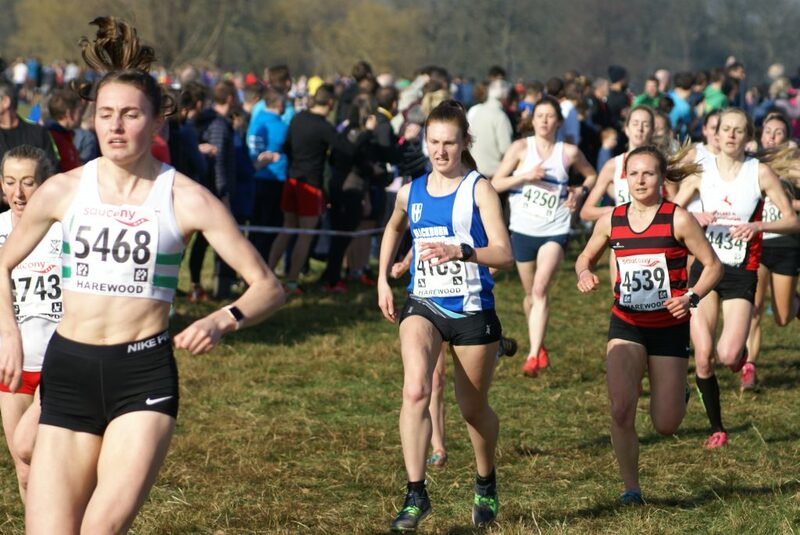 Jess Judd who ‘gave everything she had on the day’ came home in 4th position in a time of 21.10.2 at this years BUCS Championships held in Exeter after a battle with the first three Women – winner Anna Moller (20.33.0), Amelia Quirk (20.44.1) in 2nd and Mhairi Maclennan (Northern Cross Country Champion in 20.49.9) featuring a field of six hundred and nineteen finishers. 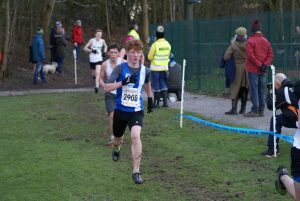 Joe Howe ran in the Men’s Race ‘A’ Race which had 1170 contesting and finishing. 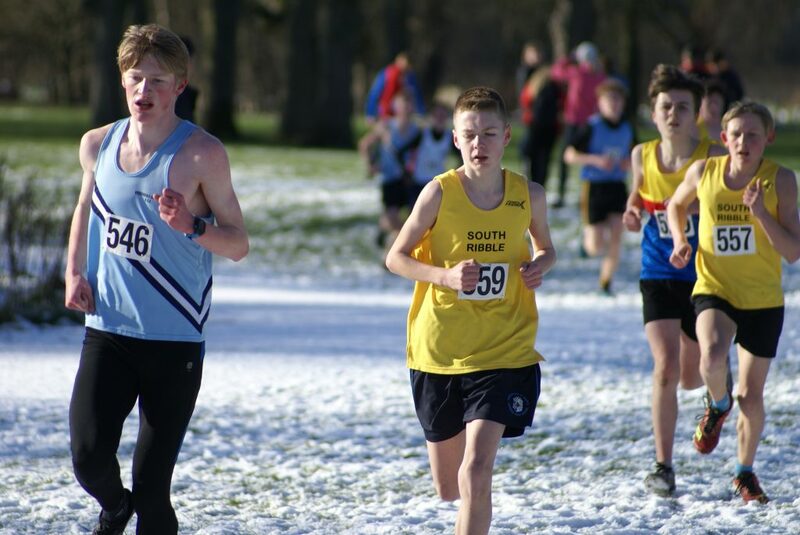 Joe had a pretty solid run, ‘similar to his run at the Northerns’ to come home in 174th place in a time of 37.57.2. 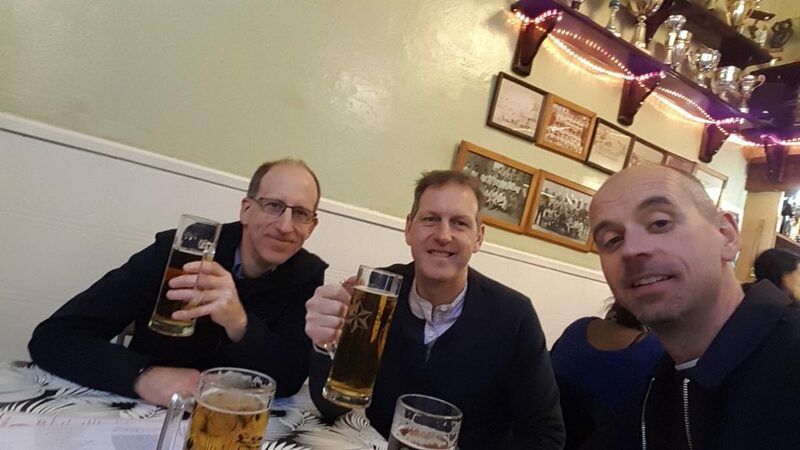 Joe Howe on the left – ‘refuelling’? 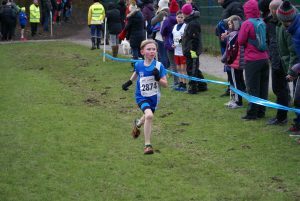 In the Greater Manchester Cross Country Championships Zachary Walmsley – running for Bolton – came home in 8th place out of a 54 strong field of runners, clocking 12.19 and earning himself a place at the English Schools Chgampionships in Leeds. 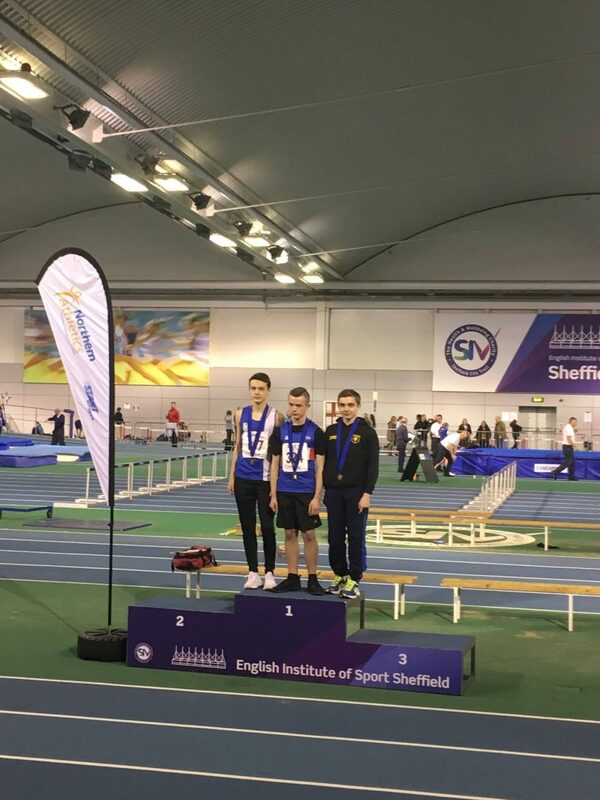 Terrific performance by U15 Ben Boocock at the Championships this weekend in the 60m Hurdles. 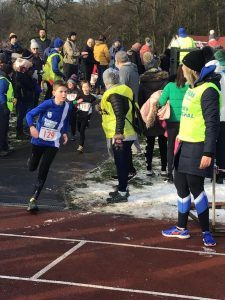 Ben qualified for the Final with a PB equaling time of 9.52 and went one better in the Final – cutting nearly three tenths of that time – to clock 9.24 and win the Silver Medal and just 200th’s behind the winner. 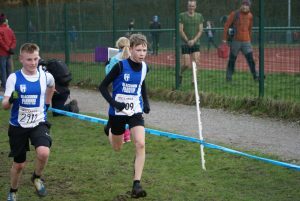 ben’s parents told us afterwards that they were delighted with the result commenting “Massive thanks to Paul Wibberley today for all his support”. 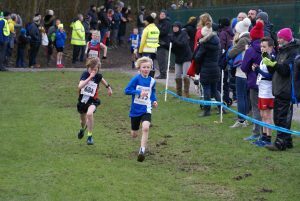 Seven hundred and ten finishers in this race won by Tipton’s Stephen Corbishley in 34.08. 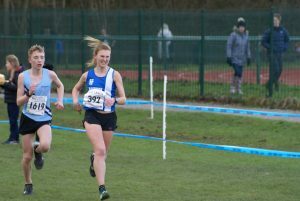 Victoria Mousley had a good run, comfortably winning the Women’s Race for the Harriers in a time of 40.58 and 44th place overall. 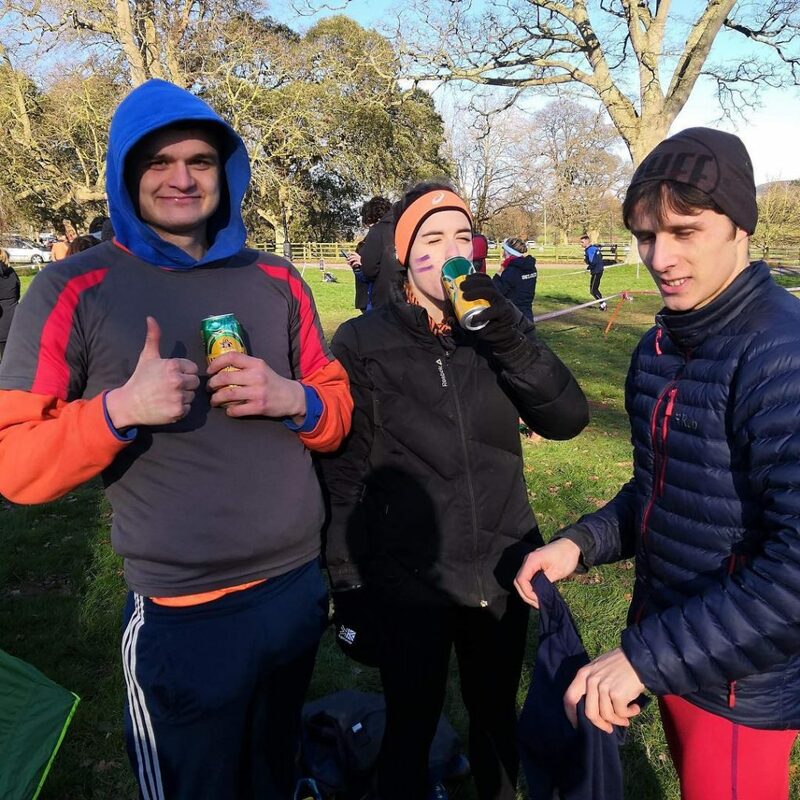 To cap a good all round day for the Club, the Harriers won the Team Race, Harry Wilkin won the Junior Men’s Race and Chris Davies won the V40 Age Group category. 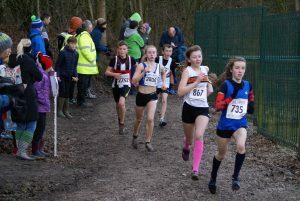 Victoria was pleased with her run and spoke to the Club after the race was over, commenting “A decent run for me, managed to pull my hamstring just on the sharp hill before the descent into Pleasington but luckily someone from the club told me i was first lady with no other in sight so i just slowed off a bit to ensure I didn’t cause an injury. 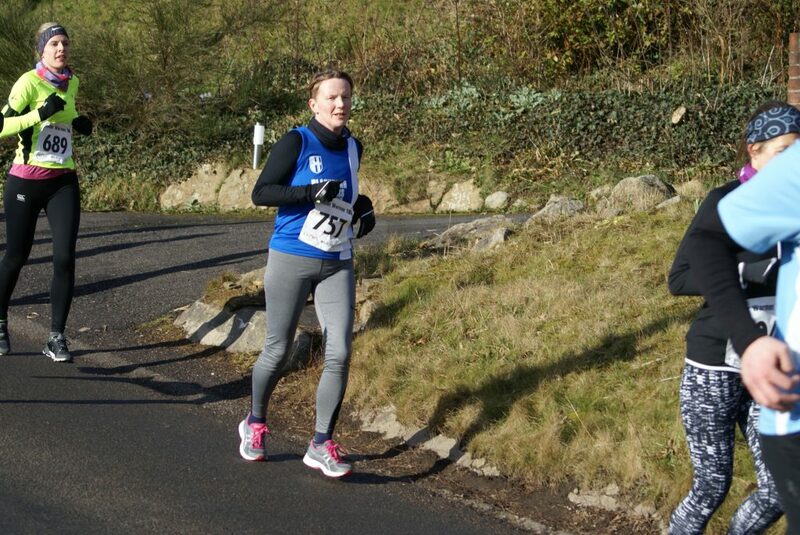 Happy to finish first lady even though my time was a bit over what i would have liked. 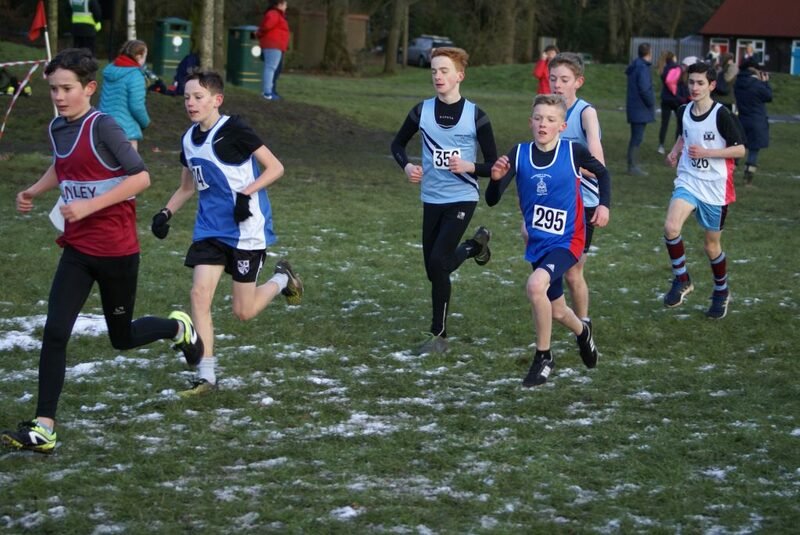 Great runs from the Harriers today. 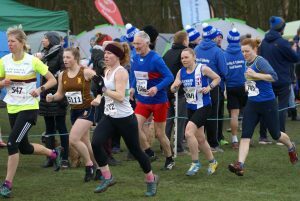 Great support on the course too from club members“. 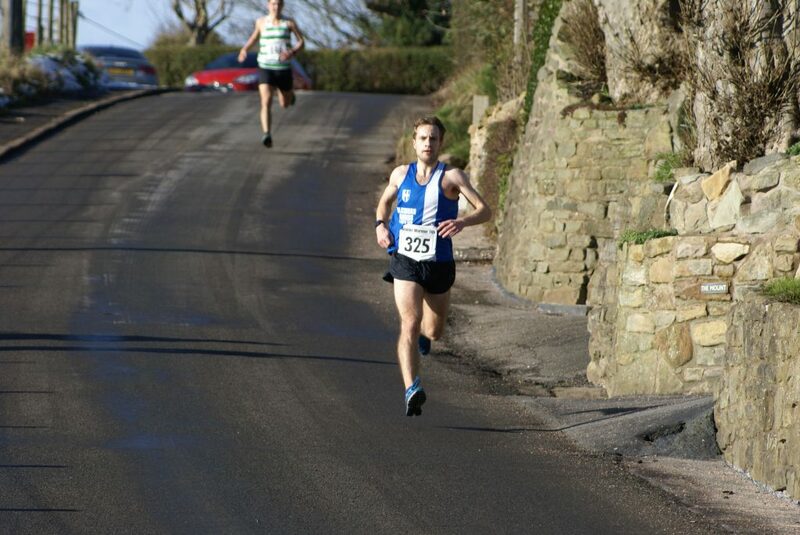 Josh Holgate had a battle with the eventual winner and was leading the race as he dropped down to Sandy Lance, approaching the climb up to the Church at Pleasington. 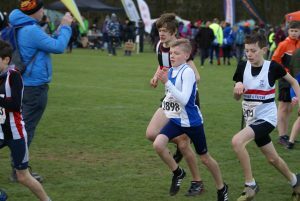 In the end, Josh had to settle for 2nd place in a time of 34.17 and commented to the Club after the Race that he “wasn’t sure how the race would go with being on and off with illness the past few weeks and not being able to get the mileage and sessions in, but overall I can’t complain with the outcome. 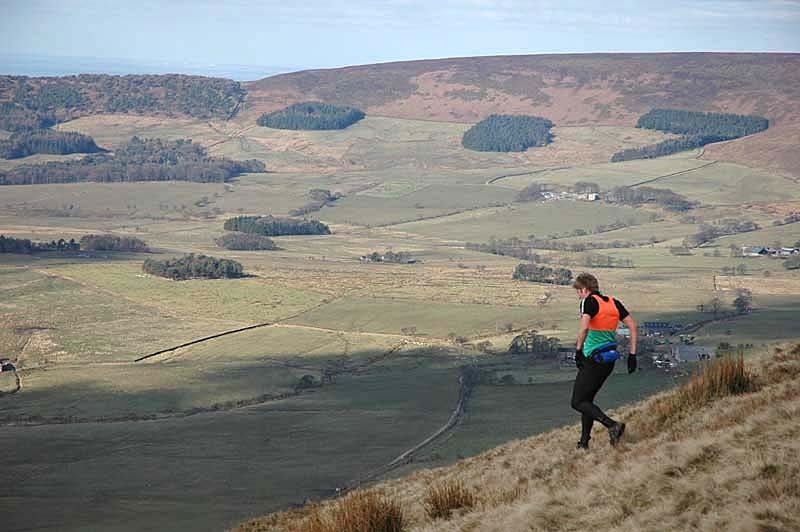 Looking back I probably went off too hard on the climb and found myself isolated on the descent and allowed the Tipton runner to creep up behind. 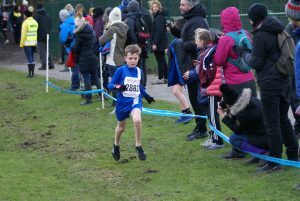 We battled it out from the duck pond to the track but sadly he had that bit more in the legs to push on at the end for the win. 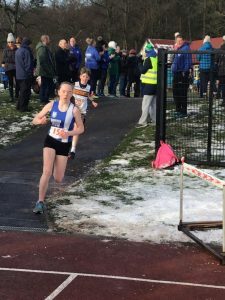 Well done to Victoria Mousely on the win and to Tom Blaney and Christopher Davies for having great runs finishing 3rd and 4th. 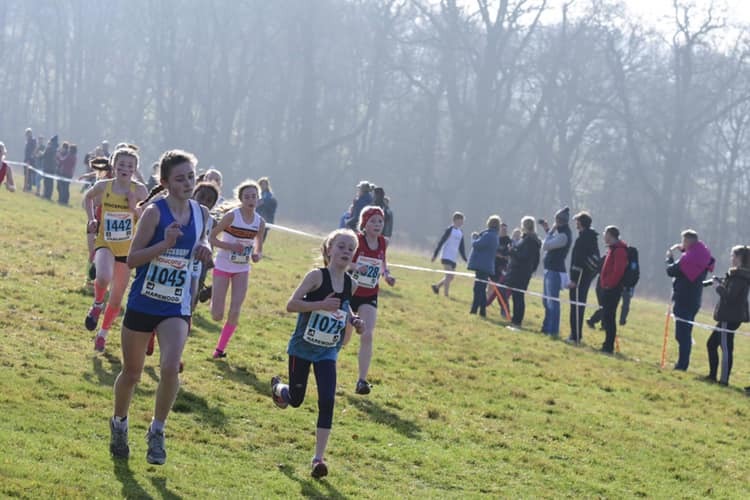 Big push now to add a bit more sharpness for National XC and the 12 stage relays”. 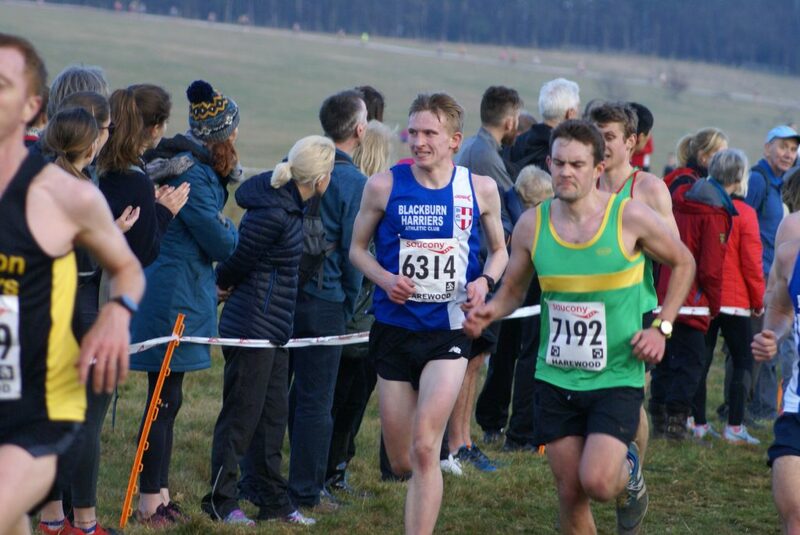 Next in for the Harriers came Tom Blaney in 3rd place in a time of 34.50 and afterwards he told told the Club “I really looked forward to todays race as its one of my favourites. 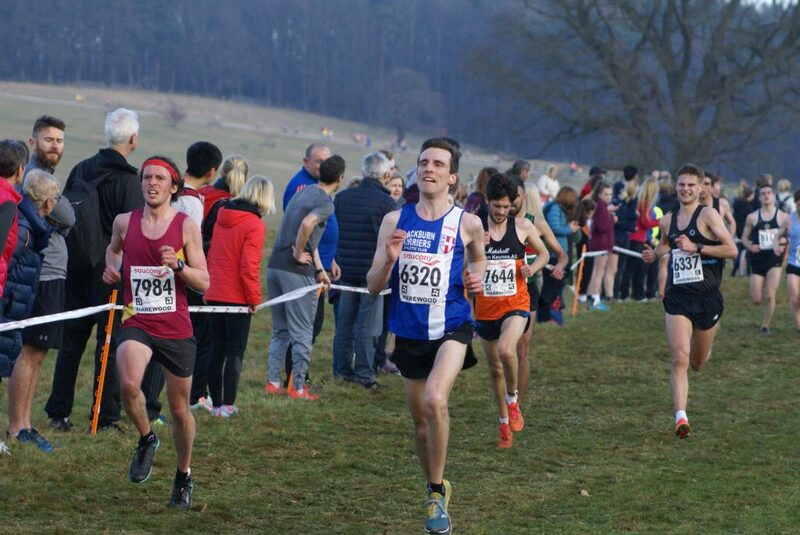 In the past few months i’ve only really run XC so i had no idea how that would translate to the road, its fair to say i was pretty pleased with my performance. 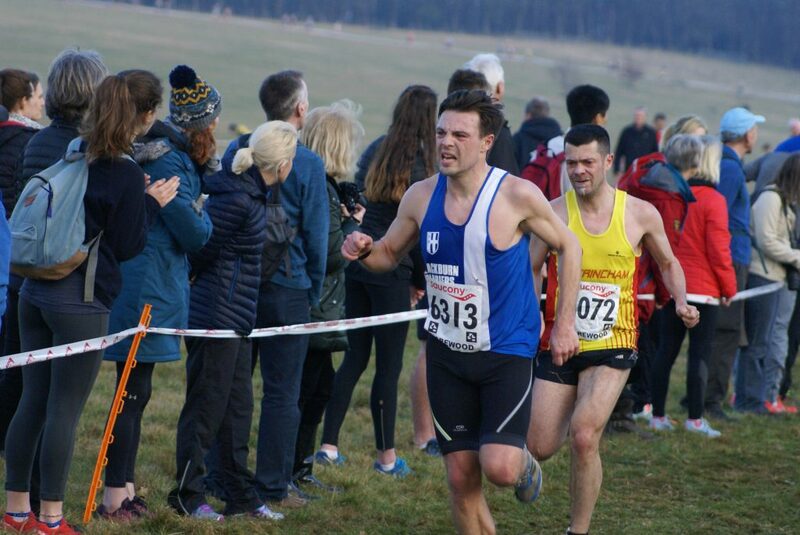 I had a really tough time hanging on to Chris for most of the race but just found an edge on the downhills and the last mile to take a hard earned 3rd place. 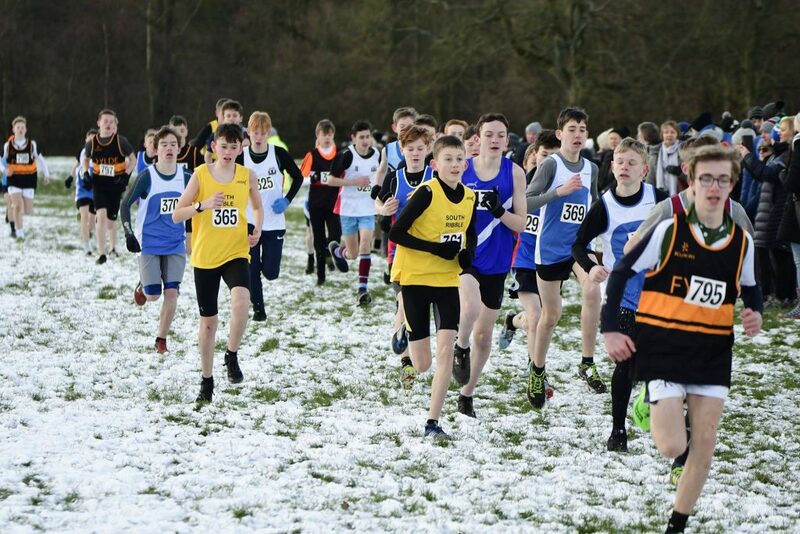 Well done to everyone that raced, a great effort by all”. 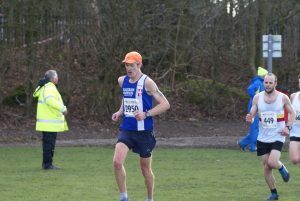 Chris Davies placed 4th overall which made it three Harriers in the first four places, clocking 35.01 and enough to give him the V40 1st prize. 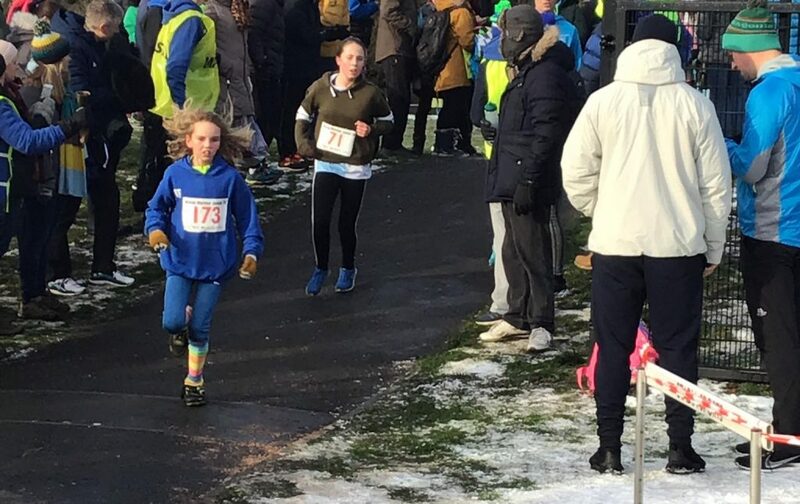 He told the Club.“Always a tough course the Blackburn Winter Warmer 10K but even harder this year with the tougher conditions. 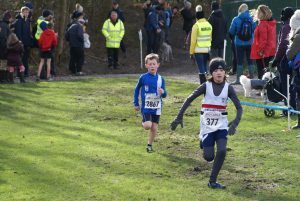 The majority of the course was runnable but the odd section had his challenges. 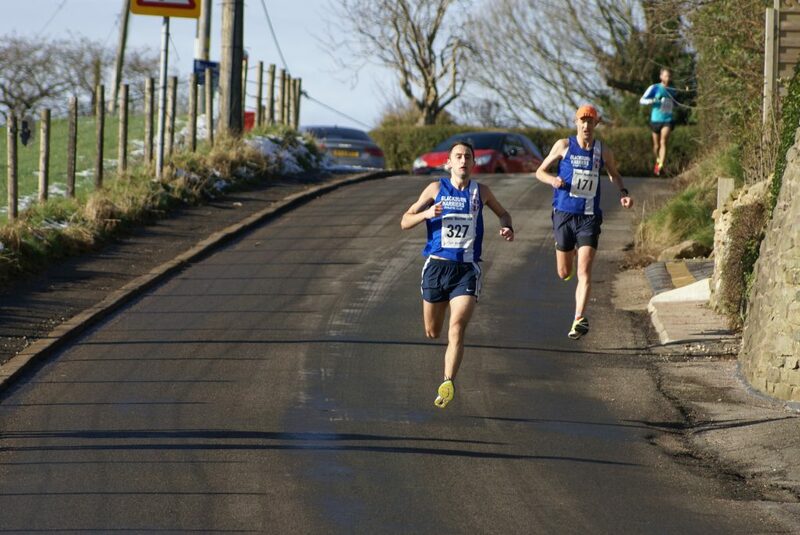 Overall I had s solid performance, a few seconds down on last year’s time but nothing to get concerned about. 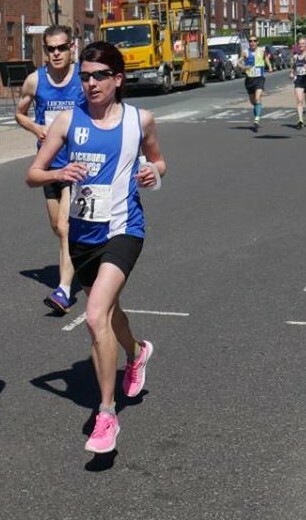 I’ve raced alot these last few weeks and trained hard due to Marathon training so things are going really well at the moment. 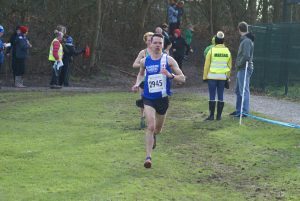 Pleased with 4th position overall, my best in this competition and 1st Vet 40 for the second year running. 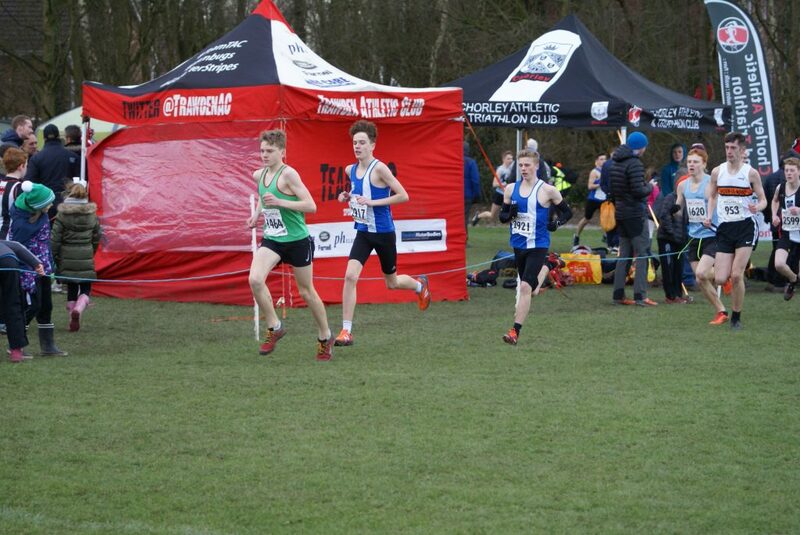 A good day for myself but great runs from Josh Holgate and Thomas Blaney . 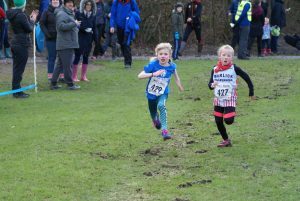 A great team effort finishing 2nd, 3rd and 4th. 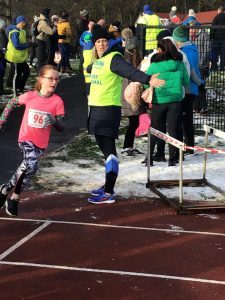 Well done to them and all the other Blackburn Harriers who ran on the day. 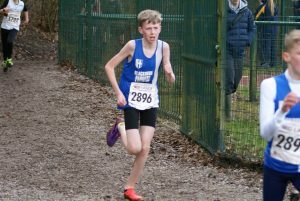 A special mention for Harry Wilkin who finished 1st Junior Male in 40:23. 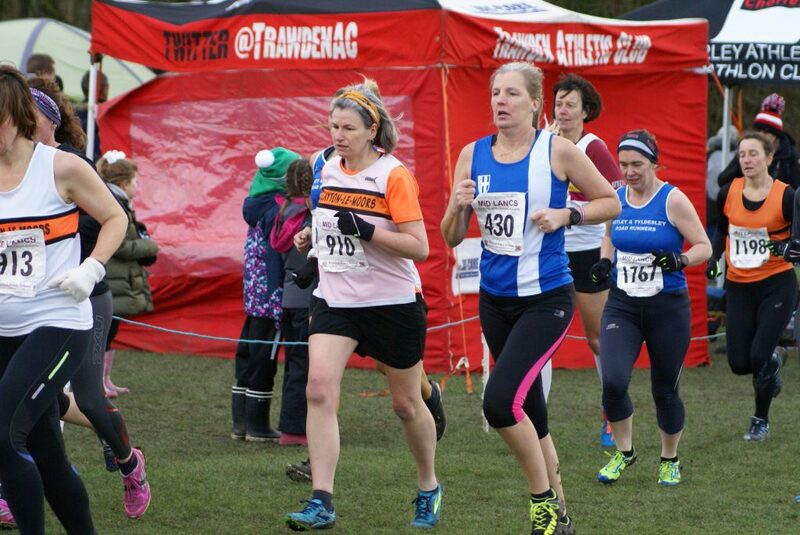 A cracking time on a tough course. 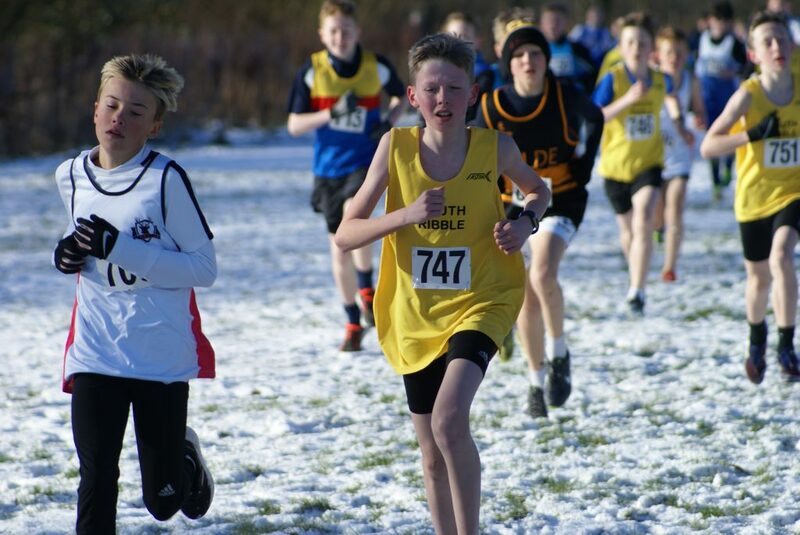 Well done all”. 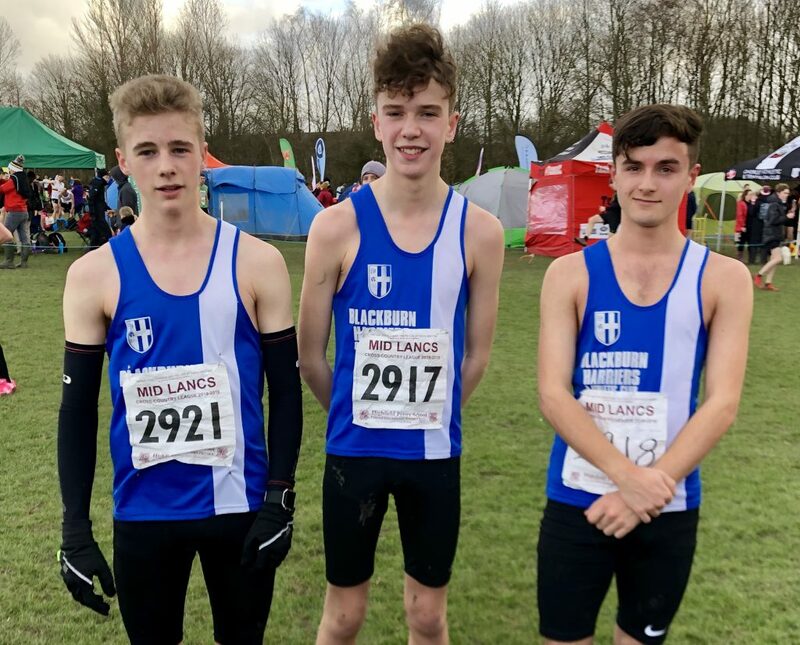 Fifteen Blackburn Harriers ran the race and after Chris Davies finished 4th the next home was U17 Harry Wilkin in 38th place with a time of 40.23 which won him the Junior Men’s first prize. 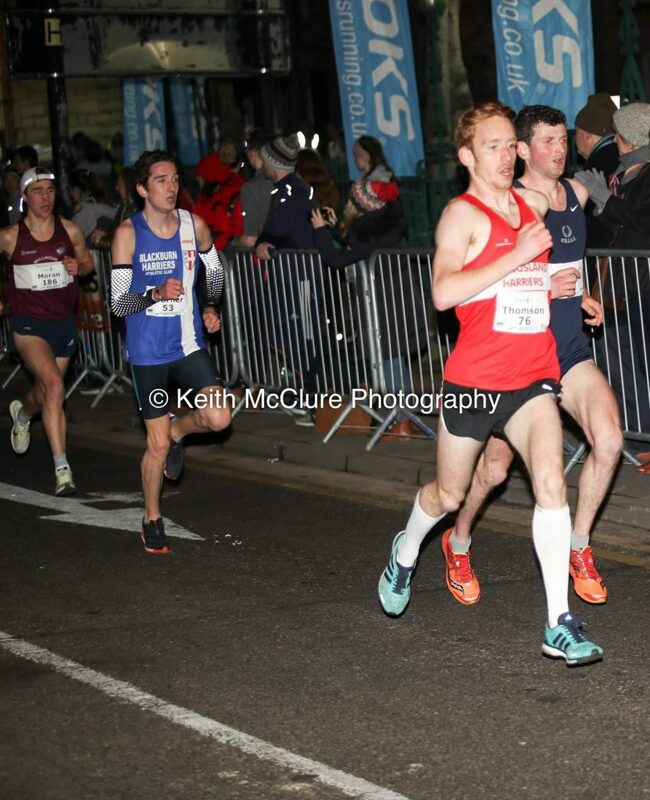 Danny Maynard was the next one in (42nd) in 40.46. 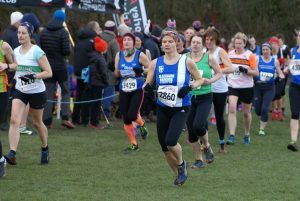 V45 Sean Procter was just five seconds behind Women’s Race winner – Victoria Mousley – in a time of 41.03 (45th) and followed home by V40 Paul Jeffries in 71st (43.03), V45 Craig Greenough (81st) in a time of 43.40), V50 Ian Clarkson – having a break from the Fells this weekend – in 143rd (47.08), V45 Lindsay Davies in a time of 47.19 (146th), V40 Paul Whittaker (167th) clocking 48.02, V50 Mark Wilkin running 48.21 in 179th, Rebecca Woodworth (366th) with a time of 56.36, V55 Alison Armour (532nd) in 63.01 and V50 Clare Wilkin (63.43) in 560th place. 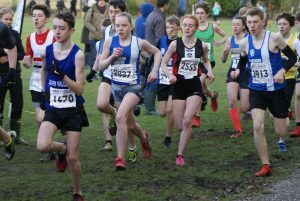 Twenty young Blackburn Harriers ran in this Junior 2k as part of a nearly two hundred strong field which was a tremendous effort. 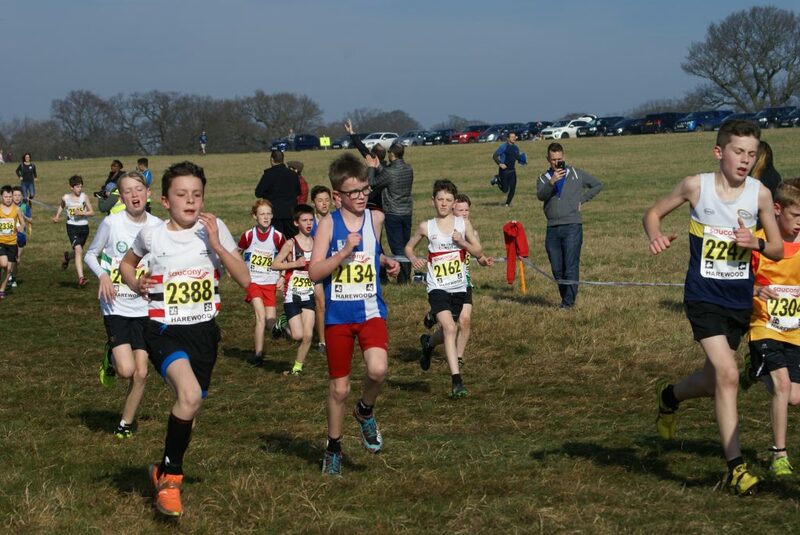 The Junior Race saw the Harriers take six out of the first ten places with 5th, 6th, 7th, 8th, 9th and 10th places which was a great effort by them. 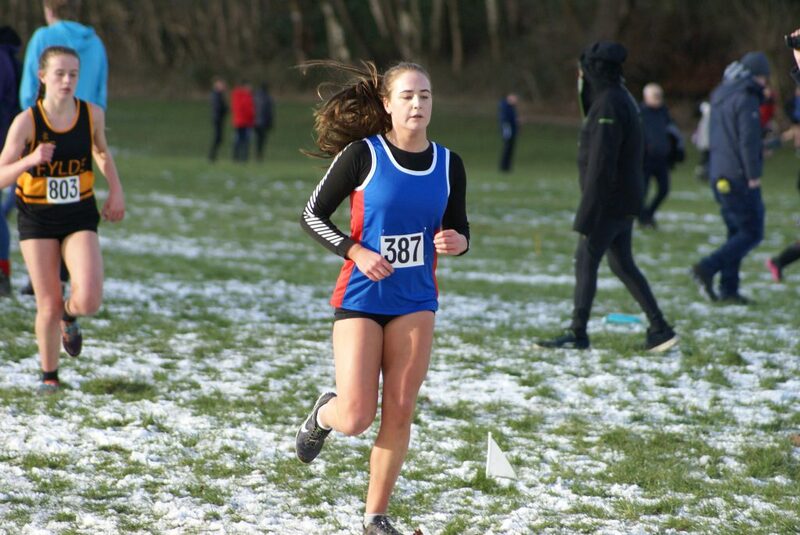 Amy Davies placed 5th overall in a time of 7.33 for the 2k course, with Saul Sharp having a very good run in 6th (7.37), Leah Hoole 7th (7.45), Daniel Smith (8th) also 7.45 and the same as Sam Aspey – the ‘pocket rocket’ – in 9th (7.45) with Oliver Gill in 10th (7.58). 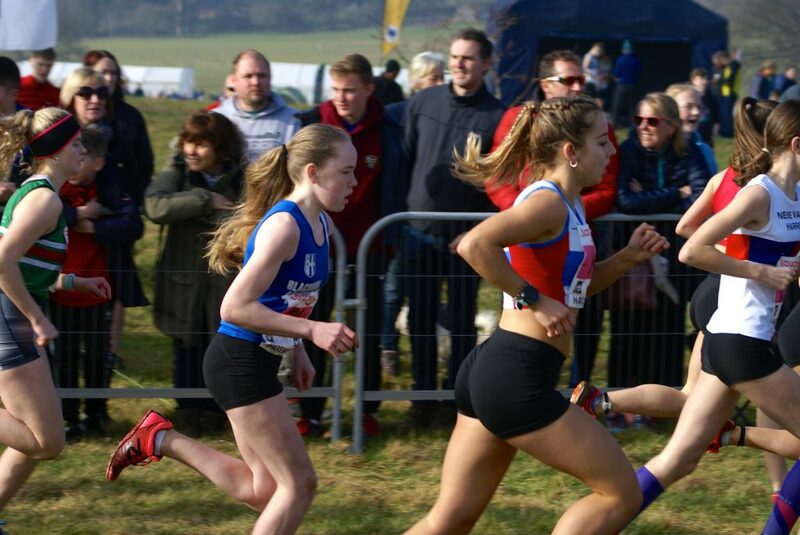 Then came Caroline Woodworth in 17th (8.44), Charlie Haworth (23rd) with a time of 9.04, Hannah Davies (26th) in 9.06, Charlotte Sousa running 9.07 in 30th, Ella Hardman (9.13) in 32nd place, Lulu Sharp finishing 37th in 9.33, Emily Smith in a time of 9.42 (38th), Tippi Francis (52nd) in 10.15, Sam Craven (64th) in a time of 10.43, Isabella Pacelli in 10.51 (71st), Isaac Smith (129th) in a time of 11.28, Grace Lewarne running a time of 11.37 (86th), Tom Hunt (12.41 in 117th place and Annabelle Logan (125th) with a time of 12.55.